Barely two weeks after Robert Paddock’s shooting rampage from the 32nd floor of the Mandalay Bay hotel Barrett-Jackson returned for its tenth annual auction at the hotel’s convention center. The resilience of the country, the city and car collectors is apparent from the results, the fourth highest in Barrett-Jackson’s history at this venue. 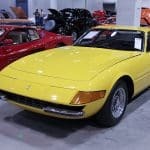 A record turnout of over 74,000 people supported not only a near-record number of consignments but also some of the most enthusiastic response to charity cars ever seen at a Barrett-Jackson auction. Paramount among the charity transactions was the sale of the 2007 Ford Shelby GT500 Super Snake of B-J President Steve Davis and his wife Janie. With all proceeds going to the Injured Police Officers Fund it brought an amazing response, finally hammering sold to thunderous applause for $1,000,000. A 2016 Jeep Wrangler Red Rock Edition brought $100,000 with proceeds, appropriately, to the UNLV School of Medicine’s Emergency Medicine Residency Program. The total raised for charity amounted to $1.64 million with much of it directed to Las Vegas-based organizations. 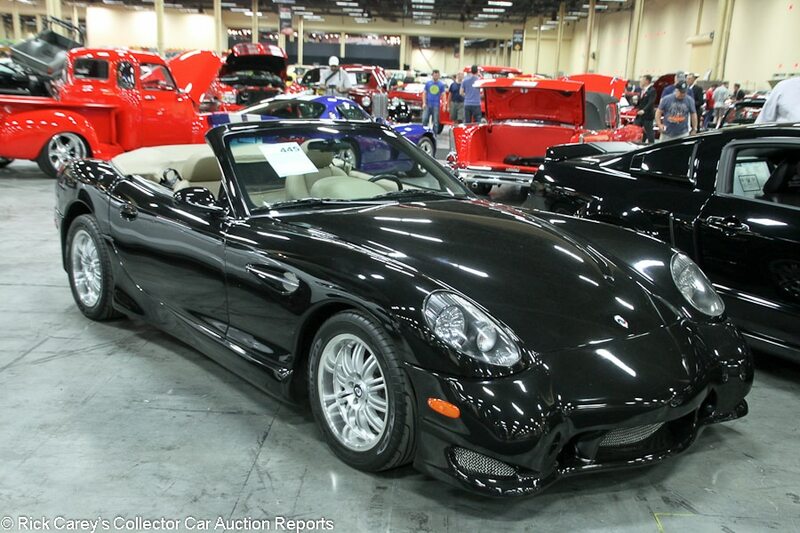 The auction itself catered to a wide variety of interests, from projects to seven-figure hypercars, and resulted in the fourth-highest sale total in B-J’s ten years in Las Vegas. There was, however, one dominant category: street rods and customs. 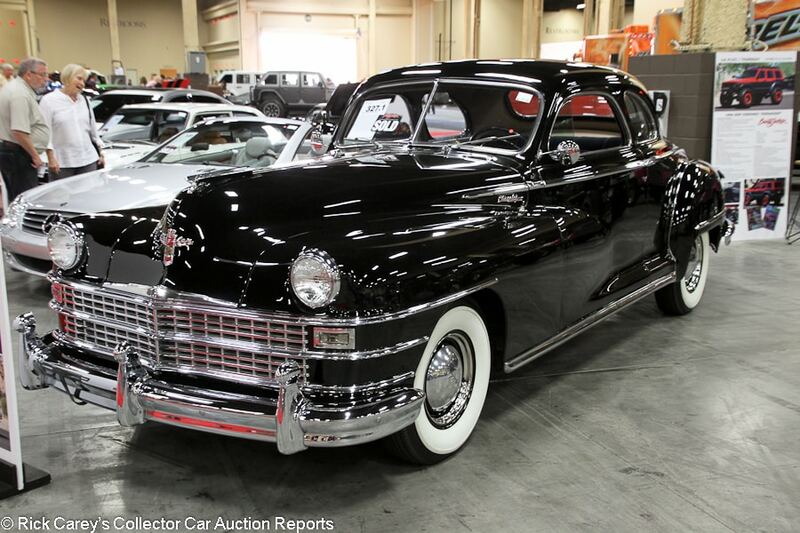 165 of the cars were self-described as ‘custom.’ That is 24.4% of the auction’s entire consignment. Others were modified or street rods without getting the ‘custom’ label. Also notable was the number of late model vehicles. 142 of the consignments were built since 2000, 21% of the entire docket. Individual results were somewhat muted, continuing the recent softening collector car market trend. An example is the sale’s second-highest seller, a 1971 Plymouth ‘Cuda Hemi, it sold for $396,000 here after bringing a reported $715,000 at Russo and Steele’s Scottsdale auction in 2006. Most other results that fell short of earlier auction transactions were not so dramatic, and a few bettered earlier transactions, but overall the evidence that the trend in transaction values is soft is impossible to ignore. Andrew Newton provided the on-site observations and photos from Las Vegas; final content and comments are the responsibility of the guy whose name is on the URL. The 83 cars reported are sorted by marque, model, body style and year. 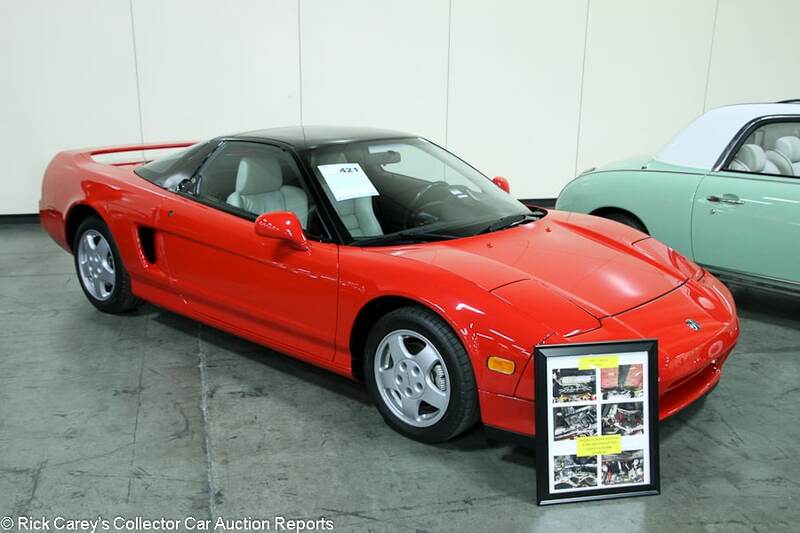 Lot # 421 1991 Acura NSX Coupe; S/N JH4NA1155MT002879; Red, Black Roof/Cream leather; Unrestored original, 2 condition; No Reserve; Hammered Sold at $65,000 plus commission of 10.00%; Final Price $71,500. 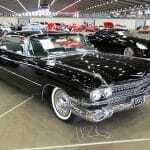 – Continental tires, power windows, air conditioning. – Showing 5,730 miles and looks like a new car, although the original owner had a low speed collision with a deer, apparently in his driveway. It has all been fully repaired. – The honesty in disclosing that minor collision is appreciated, but you probably can’t do much damage hitting a deer in your driveway and any repairs were likely minimal. The Vegas bidders realized this and ignored the one blemish on this car’s history, affording it a very strong price even considering its incredibly low mileage. 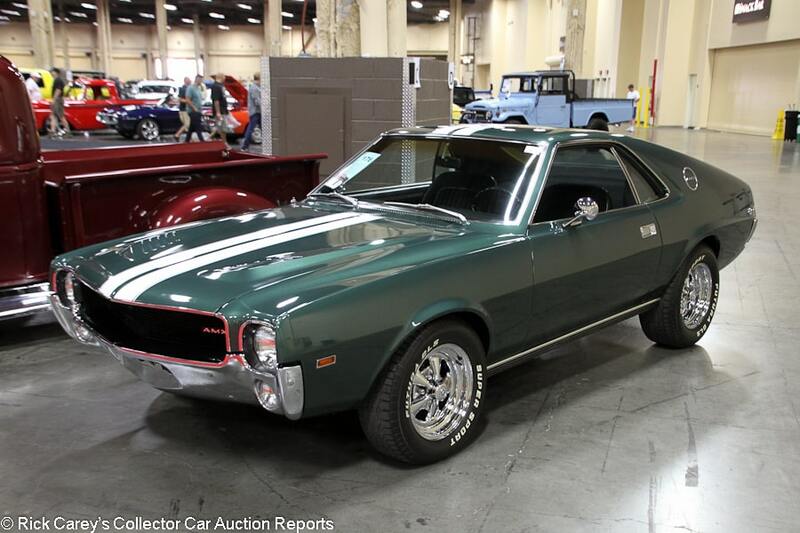 Lot # 176 1968 American Motors AMX Fastback Coupe; S/N A8M397X313589; Rally Green, White stripes/Black cloth; Older restoration, 2- condition; No Reserve; Hammered Sold at $38,000 plus commission of 10.00%; Final Price $41,800. 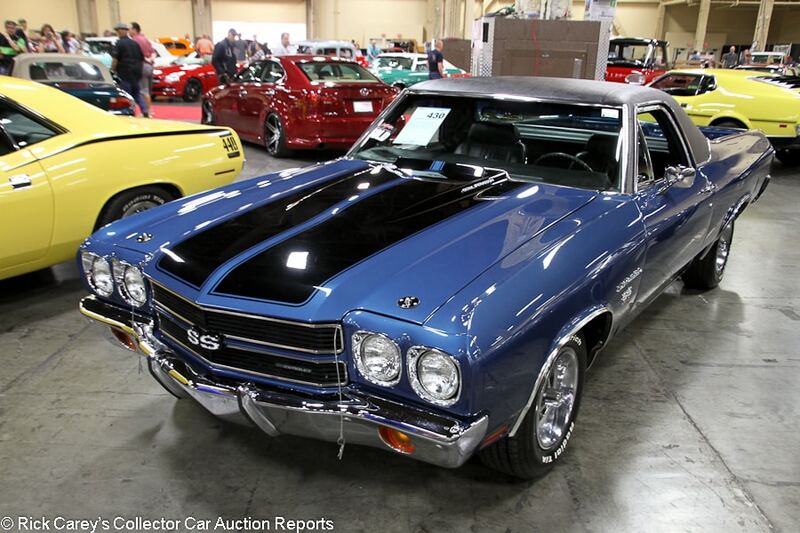 – 390/315hp, 4-speed, Cragar SS wheels, power steering, power brakes, 8-track stereo, Flowmaster mufflers, dual mirrors. – Factory 390, 4-speed car that was supposedly a California car from new. Repainted 11 years ago in original colors. Rebuilt engine. Good older paint, chrome an interior, but there is some light orange peel on the hood. Very clean underneath. Not done yesterday, but fully restored and desirably equipped. – This car sold here last year for the perfectly appropriate amount of $35,200. This result a year later is more down to the two AMC fans in the room with deep enough pockets than any big growth in AMX prices (there hasn’t really been any). For an imperfect car without the Go Package (the car card says ‘Go-Pak equipped’, auction-speak for ‘not built this way at the factory’), this was huge money for a model that normally has mixed results at auction. 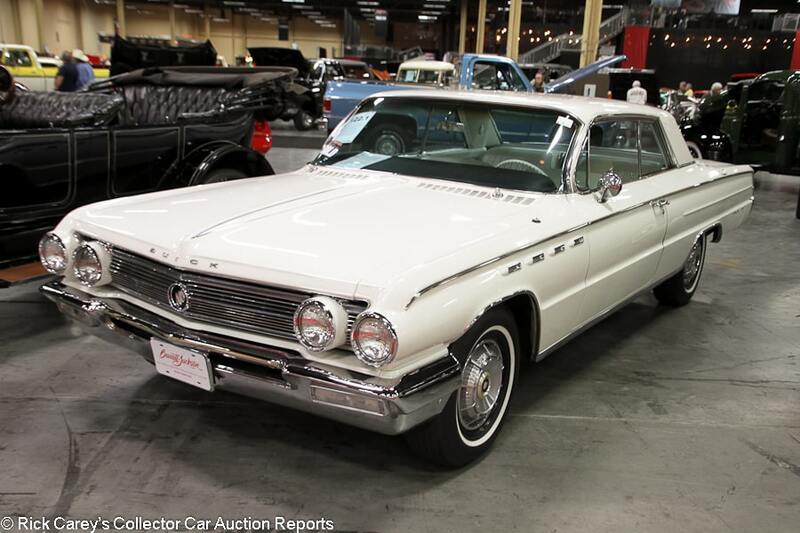 Lot # 122.1 1962 Buick Electra 225 2-Dr. Hardtop; S/N 8I2018419; Arctic White/White leather; Cosmetic restoration, 2- condition; No Reserve; Hammered Sold at $14,000 plus commission of 10.00%; Final Price $15,400. – 401/325hp, automatic, wheel covers, narrow whitewalls, power seat, factory air conditioning, power windows, power steering, added power front disc brakes, bench seat, column shift, tissue dispenser. – A California black plate car with newer paint, chrome and interior. The rest of the car is original and didn’t really need to be restored, although it has been detailed underneath. Light wrinkling to the seats and a lightly worn, cracked original steering wheel. Very good paint and chrome. The rest of the brightwork is original and lightly aged but sound. A straightforward cosmetic restoration of a well preserved California car. – Sold for $17,600 at Mecum Monterey this year. Both results are acceptable for this largely original and well-preserved car, but this second transaction obviously makes for an expensive few months of ownership for the seller. 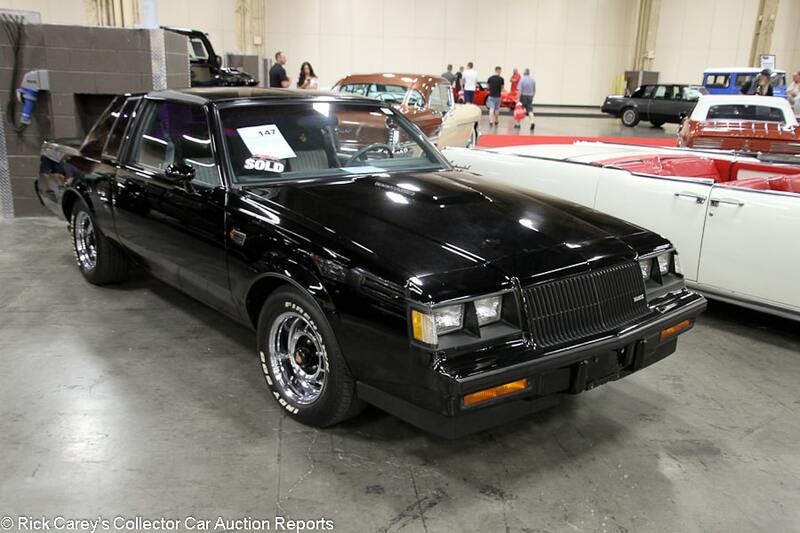 Lot # 147 1987 Buick Grand National Coupe; S/N 1G4GJ1174HP462783; Black/Black, Gray cloth; Unrestored original, 2- condition; No Reserve; Hammered Sold at $25,500 plus commission of 10.00%; Final Price $28,050. 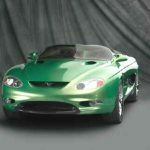 – 231/245hp, automatic, Firehawk Indy 500 tires, power windows, climate control, cassette stereo, glass T-tops, power seats. – Represented as a two-owner car. Showing 68,212 miles. Small gouge in the front bumper. The paint doesn’t have any major blemishes but it is showing its 30 years of age with light fading and detail scratches. Tidy underneath. Some wear on the steering wheel but mostly very good interior. It doesn’t look new, but it looks like a car with far less mileage than is shown on the odometer. Ideal for someone who wants a GN to actually drive and enjoy. – After a big spike at the beginning of the year thanks to some huge auction results, Grand National prices have retreated a bit more recently. This was a fair price in line with other recent results, and the new owner has a very solid almost like-new GN but won’t have to stress over every tick on the odometer like the owners of other super low-mileage mothballed examples. 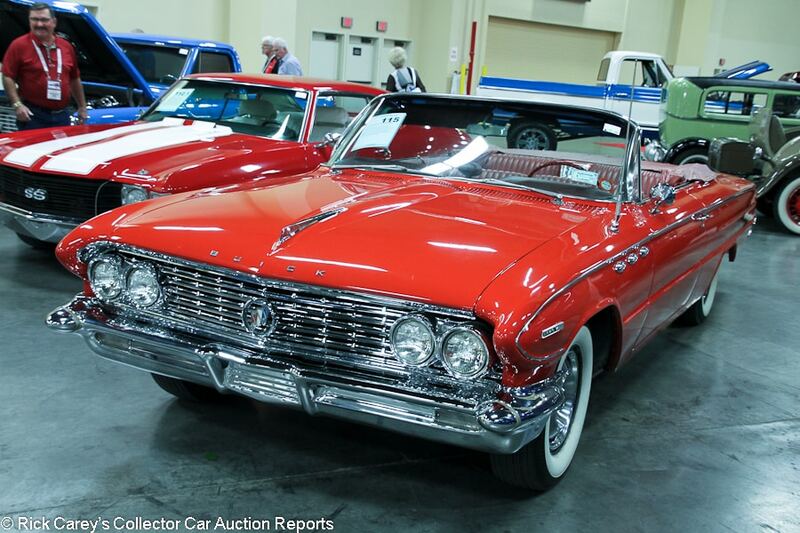 Lot # 115 1961 Buick Invicta Convertible; S/N 6H3015206; Bright Red/Red vinyl; Visually maintained, largely original, 3+ condition; No Reserve; Hammered Sold at $25,000 plus commission of 10.00%; Final Price $27,500. – 401/325hp, automatic, wheel covers, whitewalls, boot cover, column shift, Sonomatic radio, dash-mounted clock, power top, rear seat speaker. – Represented with new paint, chrome, carpets and tires. The paint does indeed look new and shows well, but only the bumpers have been redone. The rest of the brightwork is pretty dull, plus there is pitting on the interior bits and the cover for the rear seat speaker is nearly caved in with a huge dent in the middle. The dash top also has several cracks. The original seats, meanwhile, look fantastic and should be left alone. The underbody is clean and undercoated, while the engine has had at least some major mechanical work. This is a fundamentally handsome and well-kept car, and addressing some of the brightwork would make a huge difference. – Suitably more expensive than the ’62 Electra 225 hardtop that crossed the block later today and in similar well-preserved condition, this is a big, luxurious Buick convertible for an appropriate price. 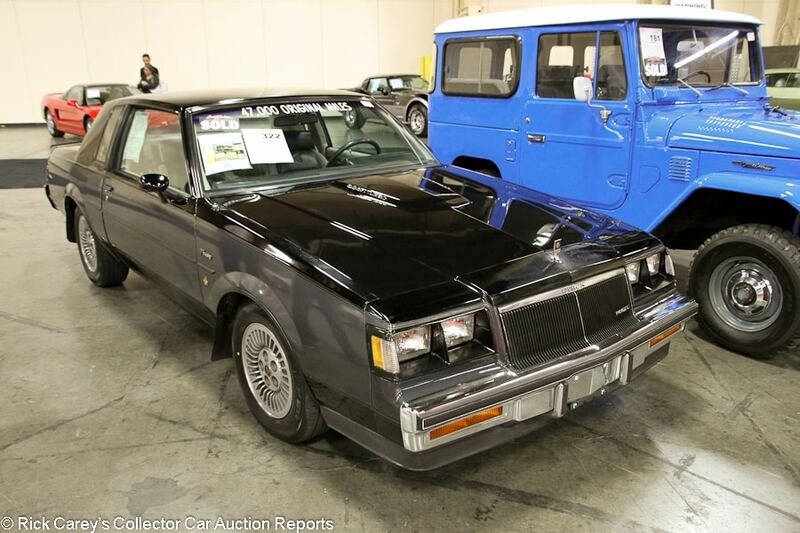 Lot # 322 1984 Buick Regal T-Type Coupe; S/N 1G4AK4791EH588439; Black, Gray/Gray cloth, Black vinyl; Unrestored original, 3 condition; No Reserve; Hammered Sold at $15,000 plus commission of 10.00%; Final Price $16,500. – 231/200hp turbo, automatic, Falken tires, console, floor shift, leather-wrapped steering wheel, limited-slip, digital gauges, climate control. – Showing 46,386 believable and represented original miles. Lightly scratched and pitted bumpers. Tired paint with numerous scratches and chips. Original and worn underneath. Light wear to the vinyl parts of the seats and some lightly worn switchgear, but mostly very good original interior. An unrestored but reasonably maintained driver. – With the popularity of the hotter Grand Nationals these days, it’s not surprising to see Regal T-Types starting to show up at auction. While down on power compared to the GN, they have that same sleeper styling and the turbo V-6 makes them quick enough to have fun with. This was strong but reasonable money for this car. 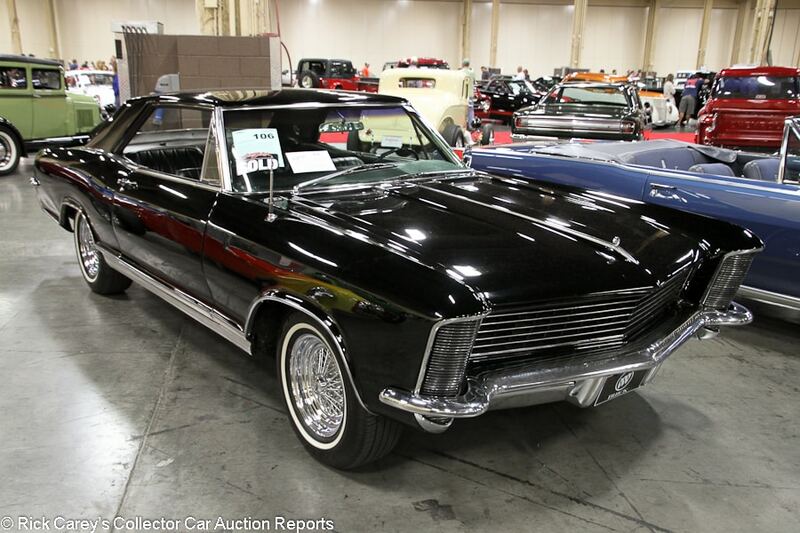 Lot # 106 1965 Buick Riviera 2-Dr. Hardtop; S/N 494475H911908; Regal Black/Black; Older restoration, 3+ condition; No Reserve; Hammered Sold at $30,000 plus commission of 10.00%; Final Price $33,000. – 401/325hp Nailhead V-8, automatic, wire wheels, narrow whitewalls, bucket seats, console, wood dash, pushbutton radio, rear seat speaker, power windows, power steering, power brakes, tilt steering column. – Represented as a one-owner car with the matching numbers engine. Good older paint. Original chrome and brightwork with light scratching on the bumpers and light pitting on the grille. Driver’s door doesn’t fit flush. Mostly good restored interior but there is a small gouge in the console. The area behind the rear seats is a bit tattered, and the lenses for the courtesy lights in the rear are missing on each side. Restored and handsome, but some problems were left unaddressed and they do stand out. – The first gen Riviera is a striking car, especially in black, but this example had too many corners cut in its restoration to justify this price, which could have bought a better one. Skipped minor items like the courtesy light lenses is a hint that other, but more important, things that aren’t readily apparent might have been skipped, too. 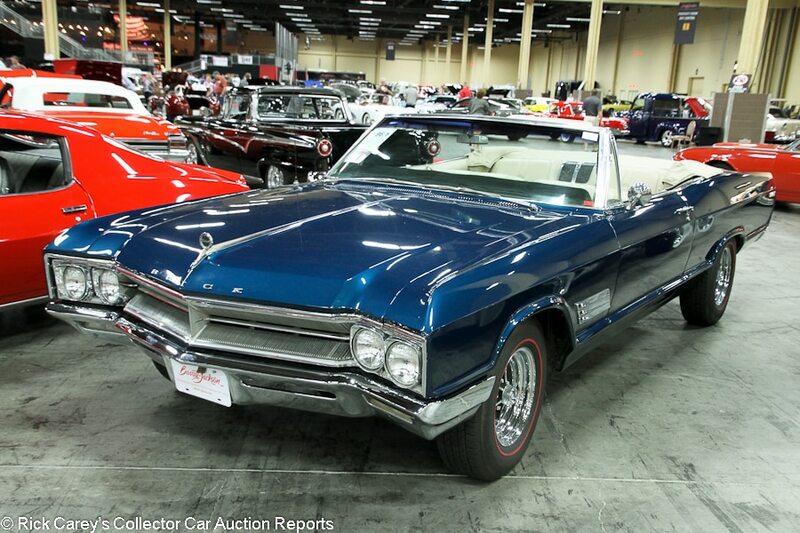 Lot # 96.1 1966 Buick Wildcat Convertible; S/N 464676C101434; Blue/Beige vinyl; Older restoration, 2- condition; No Reserve; Hammered Sold at $25,000 plus commission of 10.00%; Final Price $27,500. – 425/340hp, automatic, Red line tires, boot cover, bench seat, column shift, Sonomatic radio, rear seat speaker, aftermarket underdash tach, oil pressure, water temp and volt gauges, Grant GT steering wheel. – The grille is a bit dull. Small paint chip on the left side of the nose. Very good paint and chrome otherwise. The windshield frame has several small dents in it. Trunk fit is erratic. Tidy and restored underneath. Very good interior, but that steering wheel just doesn’t look right. It would be right at home in a little sports car, but in this cavernous open air Buick interior it looks about as big as a bottle cap, and really throws off the presentation of an otherwise very good car. – One interpretation of the small steering wheel is that the owner may have found over four decades that he or she needed more space between the seat and steering wheel rim. It’s easily remedied either by a new stock-style steering wheel or a couple years on Slim Fast. Either way it’s an appealing car at a price that is favorable to the buyer, one of several similar age and condition Buicks in this sale. 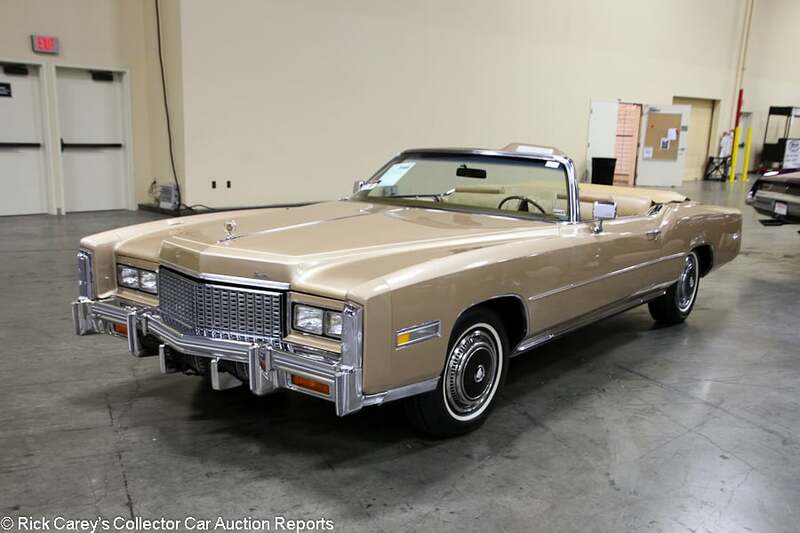 Lot # 346 1976 Cadillac Eldorado Convertible; S/N 6L67S6Q237583; Gold/Buckskin leather; Unrestored original, 2 condition; No Reserve; Hammered Sold at $25,500 plus commission of 10.00%; Final Price $28,050. – Wheel covers, narrow whitewalls, power windows, woodgrain trim, pushbutton radio. – Represented with 18,247 actual miles and as an all original car stored for many years. If that’s the case, it looks phenomenal with only negligible wear inside and out as well as underneath. The only weak spot is the brightwork, where there is some light pitting. Treated as a collectible from new. – Desirable in its own right, this original and well-preserved Eldo convertible could have brought as much as 50% more without being unreasonably expensive. On preservation alone it is marvelous; this price is for a well-maintained driver quality car with considerably more miles. 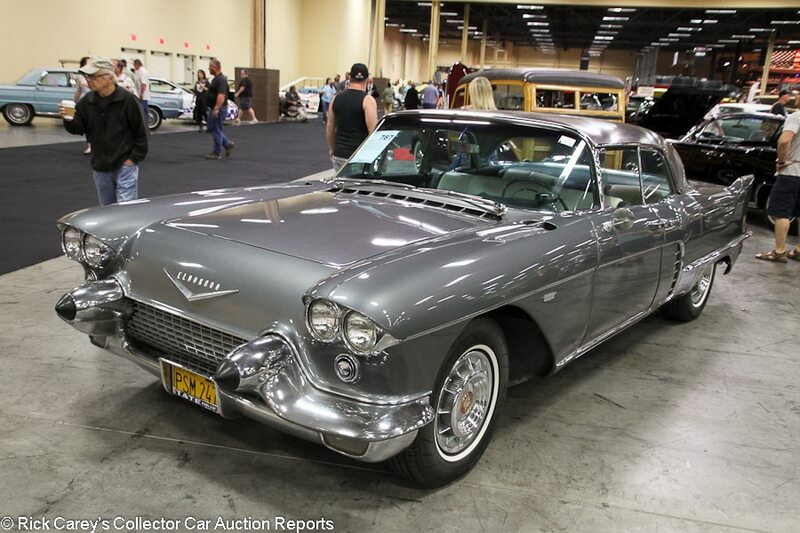 Lot # 787 1957 Cadillac Eldorado Brougham 4-Dr. Hardtop; S/N 5770089009; Gray/Black, White; Visually maintained, largely original, 3+ condition; No Reserve; Hammered Sold at $47,000 plus commission of 10.00%; Final Price $51,700. – Wheel covers, narrow whitewalls, Autronic Eye, coil springs to replace original air suspension, air conditioning, pushbutton radio. – Gaps are uneven everywhere. Several cracks around the edges of the hood. Chips around the door edges. Dull bumpers and brightwork. Long scratch on the front bumperette. Looks like it was restored underneath at some point. Small dent in the left rear fender. Small dent in the roof. Wavy dash top. Dull original dash and switchgear. Good, lightly worn seats. Maintained, but not totally original. – Sold for $71,500 at the Auctions America/RM Sotheby’s Santa Monica sale earlier this year after being bid to only $35,000 at Mecum’s Anaheim sale last November, the consignor should be overjoyed at this result, even under the pre-sale estimate range. These transactions seem all over the place and they are, but they are all below market value for even rough examples, suggesting that Brougham buyers want good, sorted cars and that this example may have more problems than we are aware of. It will cost the moon to take this from being an aged driver to being merely good. 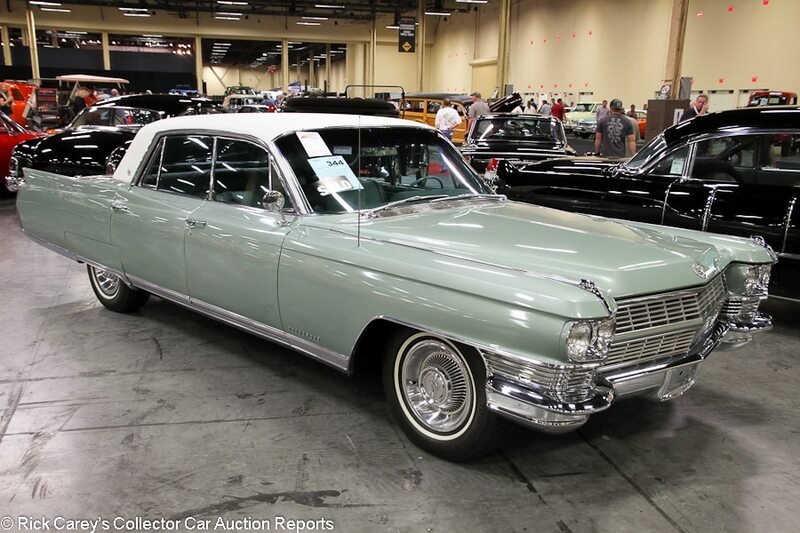 Lot # 344 1964 Cadillac Fleetwood 60 Special 4-Dr. Sedan; S/N 64M002515; Seacrest Green, White vinyl roof/Green; Older restoration, 2 condition; No Reserve; Hammered Sold at $32,500 plus commission of 10.00%; Final Price $35,750. – 429/340hp, automatic, wheel covers, narrow whitewalls, dual mirrors, power windows, factory air conditioning, arm rest, column shift. – Represented with AACA Senior award. Very good paint and chrome. Very good roof vinyl. Even gaps. Excellent interior. Tidy underneath. Not restored yesterday, but always treated like a show car and needs nothing. – Sold at RM’s Arizona auction in 2010 for $29,700, there is nothing to snipe at in its condition or the preservation of its restoration and it brought a superior price that reflects its quality. 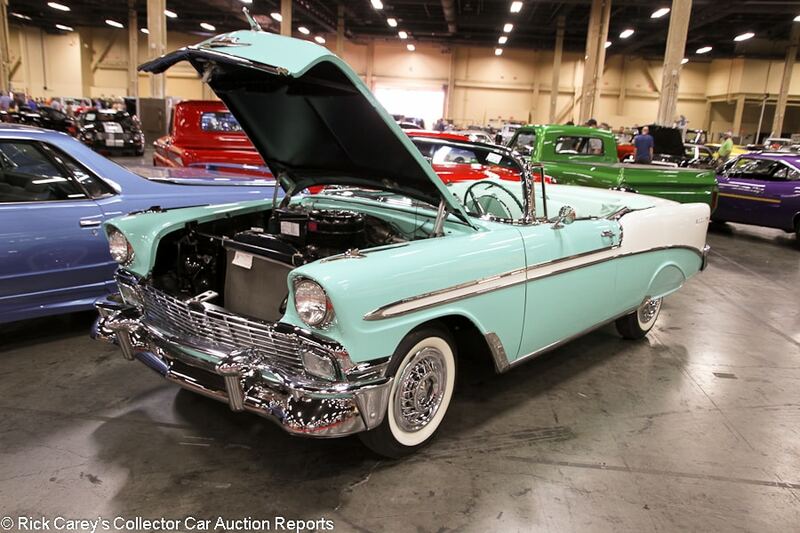 Lot # 456.1 1956 Chevrolet Bel Air Convertible; S/N VC56S125722; Pinecrest Green, White/Light Green vinyl with Green cloth inserts; Older restoration, 2- condition; No Reserve; Hammered Sold at $75,000 plus commission of 10.00%; Final Price $82,500. – 265/205hp, Powerglide, wire wheel covers, whitewalls, fender skirts, hood ornament, Continental kit, power windows, power top, dual mirrors, pushbutton radio, dash clock, tissue dispenser. – Good but used restored engine bay. Good older paint, chrome and interior with no major blemishes. Not super fresh, but doesn’t need anything, either. – Even at this result there is some room for the new owner to fluff up this Bel Air at which point there might be a modest profit left in it. 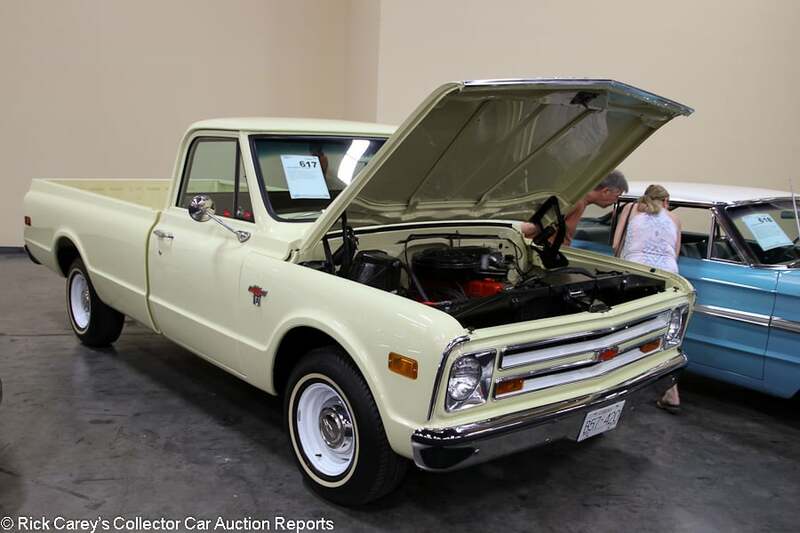 Lot # 617 1968 Chevrolet C-10 Fleetside Pickup; S/N CS1481122498; Yellow/Brown; Recent restoration, 2 condition; No Reserve; Hammered Sold at $19,500 plus commission of 10.00%; Final Price $21,450. – 250/155hp, white steel wheels with hub caps, narrow whitewalls, wood bed, column shift 3-speed. – Sparsely equipped truck with six-cylinder engine, no power accessories or radio. Nevertheless, it has gotten a lot of high quality attention. The engine bay and frame are both spotless and fresh. The paint and chrome are both excellent. The gaps are even. The interior is excellent and fully redone. There is just nothing to knock this truck for. It’s gorgeous. 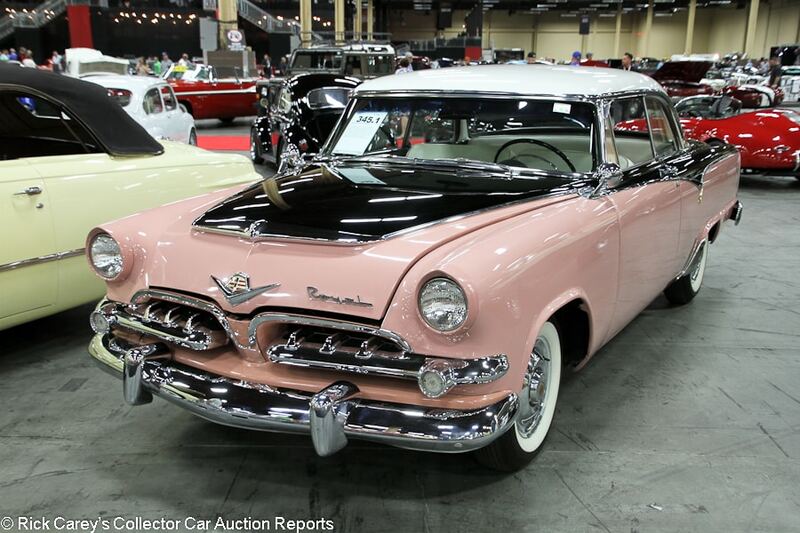 – Sold for $24,200 at Barrett-Jackson Scottsdale this year in the same condition. 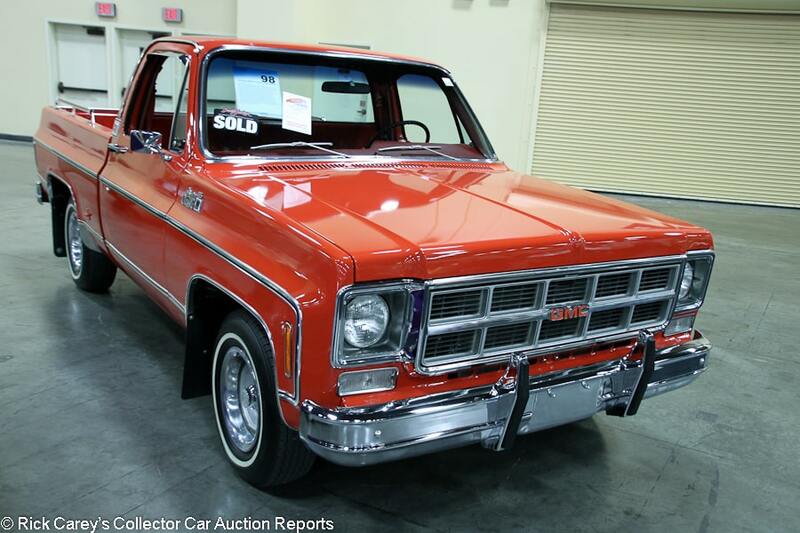 Anything over 20 grand is a lot of money for an old six-cylinder C10, but this gorgeous example deserves it and the bidders have come to the same conclusion twice now. Lot # 398.1 1968 Chevrolet Camaro 2-Dr. Hardtop; S/N 124378N458725; Tuxedo Black, White Nose Stripe, Black Vinyl Roof/Black vinyl; Older restoration, 2- condition; No Reserve; Hammered Sold at $35,000 plus commission of 10.00%; Final Price $38,500. – 327/275hp L30 engine, 4-speed, hub caps, Wide Oval tires, rear spoiler, rosewood steering wheel, bucket seats, factory radio, power steering, power brakes. – Very good paint and chrome. Clean, straight roof vinyl. Very good fully restored interior. Light road wear but fully restored underneath. Factory gaps. It lacks the power and sportiness of a more valuable Z/28 or SS, but this car has all the presence of those cars and has received a high quality full restoration. It has seen light use, but has no needs. – Sold at Mecum Dallas in 2012 for $39,220, at Russo and Steele Scottsdale in 2013 for $30,800, then not sold at a $32,000 high bid at Mecum Dallas this year. Fortune shined on the seller here with a very strong price for a base Camaro that was worth holding out for. 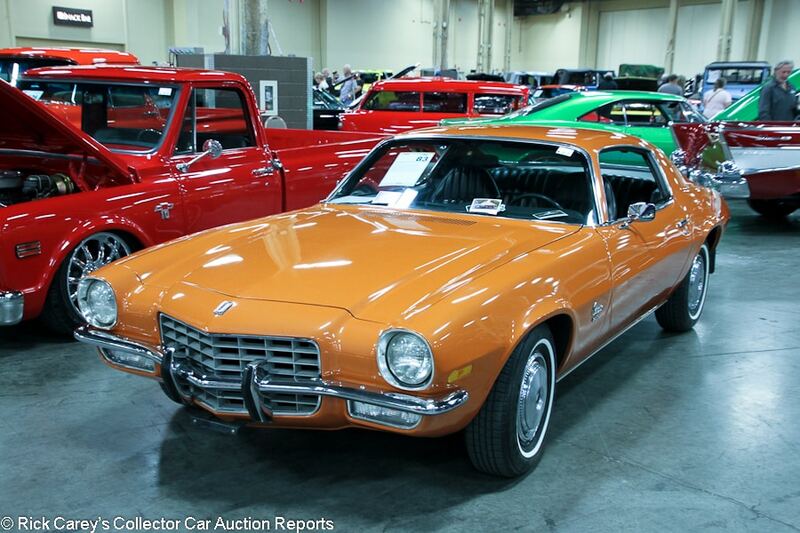 Lot # 83 1973 Chevrolet Camaro LT Sport Coupe; S/N 1Q87H3N150225; Orange/Black vinyl; Visually maintained, largely original, 2- condition; No Reserve; Hammered Sold at $16,500 plus commission of 10.00%; Final Price $18,150. – 350/175hp, automatic, wheel covers, narrow whitewalls, column shift, factory radio. – Same owner since 1976 and seemingly all bone stock. Decent older repaint that is a bit faded but not bad. Good original chrome. All the shut lines are uneven, but they probably always were. Good newer upholstery in the front and the rest of the interior is well kept. Clean newer exhaust. Solid underbody. Maintained but never fully restored and looks like it has enjoyed a pampered life in a dry climate. Not perfect but handsome and honest. It is in much better shape than most of the ’73 Camaros you see out there. 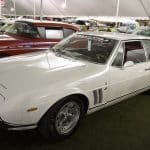 – For 1973, the Camaro SS was dropped and the LT took its place in the lineup, but the LT wasn’t exactly a real replacement with its 350/175hp engine. This was a straightforward result, but it was also slightly favorable to the buyer since such good unrestored and unmolested ’73s aren’t easy to come by. 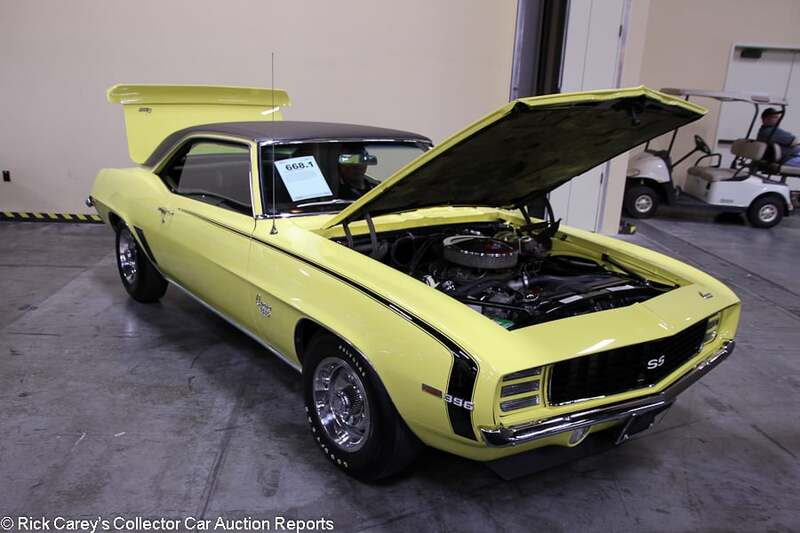 Lot # 668.1 1969 Chevrolet Camaro SS 396 2-Dr. Hardtop; S/N 124379N543170; Daytona Yellow, Black vinyl roof/Black vinyl; Older restoration, 2 condition; No Reserve; Hammered Sold at $45,000 plus commission of 10.00%; Final Price $49,500. – 396/375hp L78 engine, 4-speed, Rally wheels, Polyglas tires, rear spoiler, Hurst shifter, rosewood steering wheel, factory radio, power steering, power brakes. – Represented as 74,800 original miles but without a claim for the driveline’s originality. Very good restored engine bay and underbody. Very good paint, chrome and roof vinyl. Erratic door fit. Excellent interior. No word on when this car was restored, but it was fully done and done to high standards. – This is on the modest end for a 4-speed L78 SS 396 but reflects reasonable skepticism among the bidders due to its lack of documentation. If it is what it appears to be it is a good deal; if it isn’t it was bought right. Lot # 92 1992 Chevrolet Camaro Z/28 1LE Sport Coupe; S/N 1G1FP23F9NL107659; Medium Quasar Blue/Gray cloth; Unrestored original, 2+ condition; No Reserve; Hammered Sold at $29,000 plus commission of 10.00%; Final Price $31,900. – 305/205hp, 5-speed, 1LE package with limited-slip, 18-gallon baffled fuel tank, heavy duty brakes, Goodyear Eagle tires, A/C delete, Delco radio. – Sat for many years and represented to have just 1,944 miles, but the fuel system has all been gone through. Presents like a new car with excellent paint, interior, and underbody corresponding with the low miles. One of 705 1LEs built in ’92, which was one of the more prolific years for the SCCA showroom stock 1LE model that GM never promoted. – This is a Camaro valued more for its rarity than for scintillating performance and it will intrigue Camaro fans wherever it’s shown. The price is a substantial premium for originality and low miles, and it deserves to be. 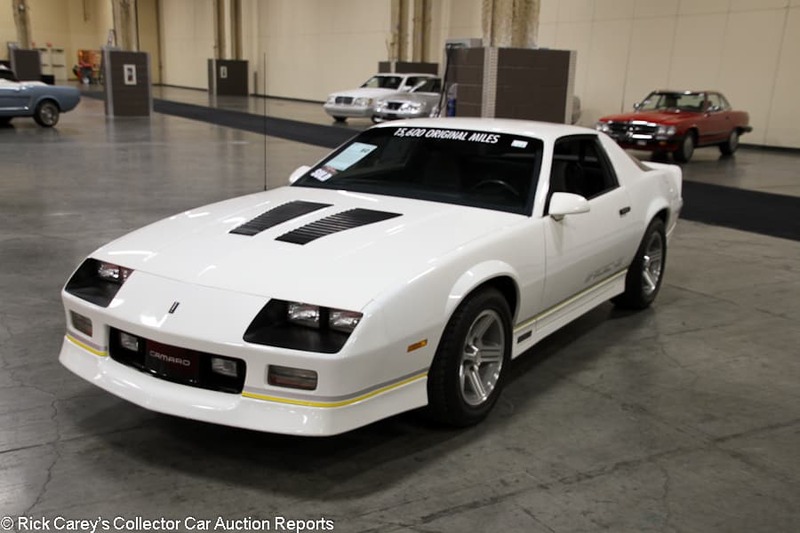 Lot # 60 1990 Chevrolet Camaro Z/28 IROC Sport Coupe; S/N 1G1FP238XLL126266; White/Gray cloth; Unrestored original, 2 condition; No Reserve; Hammered Sold at $17,000 plus commission of 10.00%; Final Price $18,700. – 350/245hp L98 engine, automatic, tinted glass, console, power windows, air conditioning, CD stereo, oil cooler, performance axle, Flowmaster exhaust. – Described as 15,627 miles from new and always maintained. There are three tiny paint chips on the nose, but those are the only flaws to speak of. Otherwise, it looks showroom fresh. It was a California and then a Texas car before going to a private collection in Arizona, which partly explains the level of preservation and low miles. – Although most of the third gen Camaros you still see on the road are pretty rough, the good examples of desirable models have gained some appreciation over the past couple of years, with low mileage examples like this being the most sought after. Today’s market probably could have seen this car sell on the other side of 20 grand, but this is still a number both parties can be satisfied with. 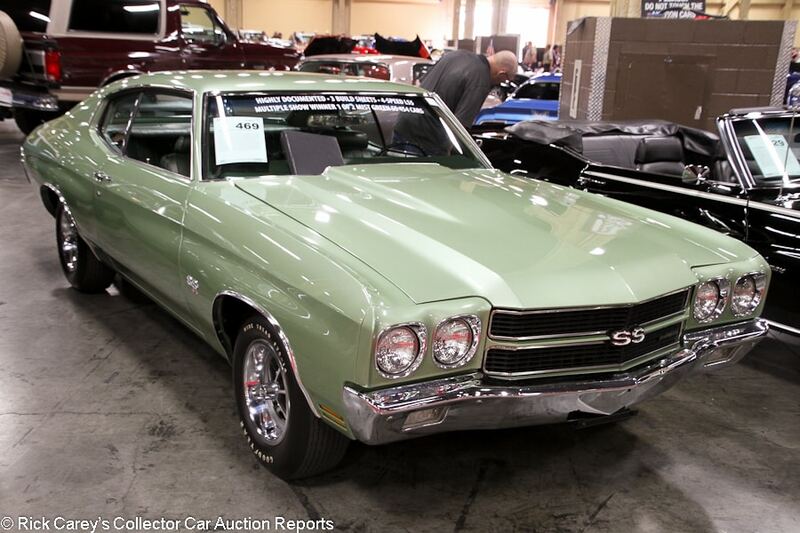 Lot # 469 1970 Chevrolet Chevelle SS 454 2-Dr. Hardtop; S/N 136370K189329; Mist Green/Medium Green; Older restoration, 2- condition; No Reserve; Hammered Sold at $58,000 plus commission of 10.00%; Final Price $63,800. – 454/360hp LS5, M22 4-speed, Goodyear Wide Tread tires, bench seat, Hurst shifter, factory radio, Protect-O-Plate, build sheets. – Rare equipment and color combination. There is a big paint blemish on the right rear fender. Factory door gaps. Some scratches on the right front wheel well trim. Lightly scratched left front bumper. Represented as matching numbers. Very good, essentially like new interior. Very clean underneath. One repaint, it is mostly unrestored. A well-documented, rare car. – This car hammered not sold at Silver’s Carson City sale in 2012 at a $40,000 high bid, then sold at Barrett-Jackson Reno the following year for $53,900 and then again for $55,000 at Barrett-Jackson Northeast last year. This was strong money for an LS5 and the deal is slightly favorable to the seller, but it’s still not an outrageous price. 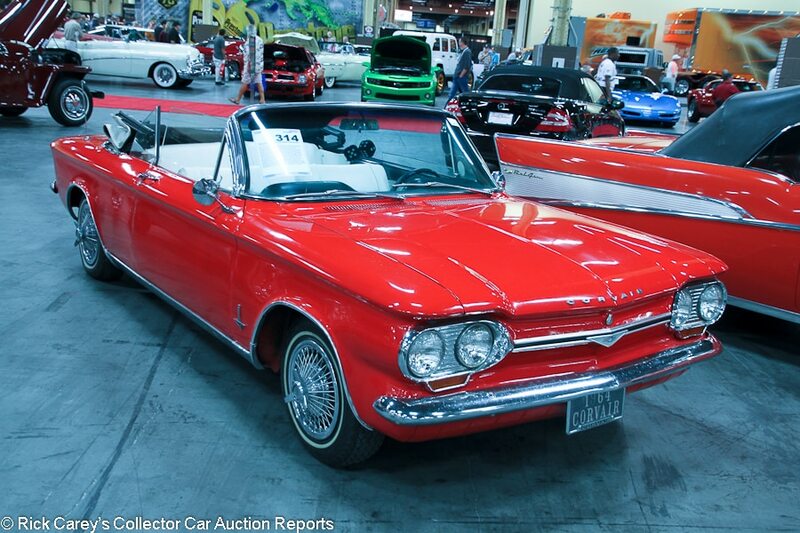 Lot # 314 1964 Chevrolet Corvair Monza Convertible; S/N 40967W143038; Red/White vinyl; White Vinyl top; Unrestored original, 3 condition; No Reserve; Hammered Sold at $7,500 plus commission of 10.00%; Final Price $8,250. – Wire wheel covers, factory Monza wheel covers included, narrow whitewalls, Grant GT steering wheel, factory radio, Powerglide. – Dull, lightly scratched original paint and chrome. Body filler in several places. The original top and interior have some light discoloration but are in good shape. Lots of road wear underneath but no major rust. A neat running project that you could enjoy as you worked on it but it is quite a way from being something proud to own. – Corvairs certainly have a following, but it’s just not very big and these cars have always been pretty affordable. This is a rewarding driver for under 10 grand that has plenty of needs, but after a few thousand dollars could be gorgeous. 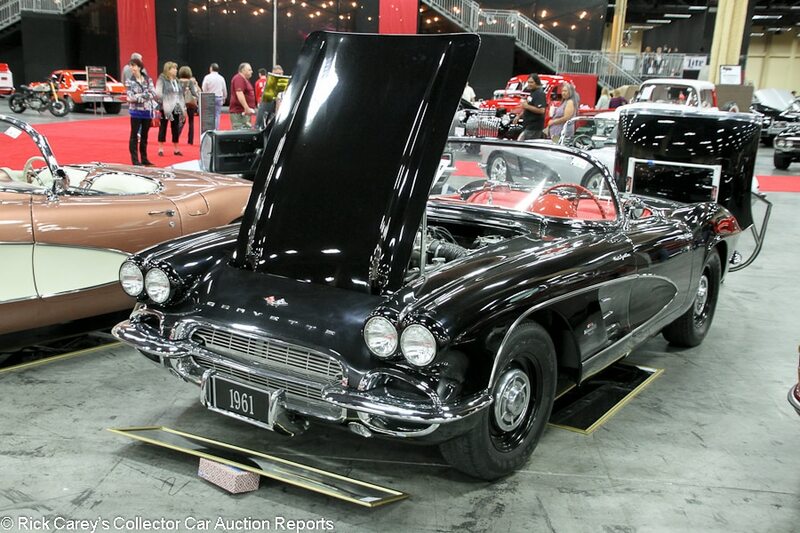 Lot # 681 1961 Chevrolet Corvette FI Convertible; S/N 10867S109937; Tuxedo Black/Red vinyl; Facsimile restoration, 3 condition; No Reserve; Hammered Sold at $53,000 plus commission of 10.00%; Final Price $58,300. – 283/315hp Fuelie, 4-speed, hub caps, Firestone Blackwall tires, later aluminum radiator, upgraded to big brakes, radio and heater delete. – An undocumented car represented as a restoration finished last year but actually presents like a partially redone driver. The underbody is freshly restored, but the engine bay has plenty of older bits and both paint and chrome look 30 years old. The wheels have been repainted but the hub caps are original. The interior has been fully restored and looks great. Inconsistent presentation and lack of history does not tend to inspire confident bidding. – And it didn’t in this case. This is a realistic number for a Fuelie clone that is fast and handsome without the six-figure price tag of a documented genuine example. The car card said ‘Over $100,000 invested in this Corvette’, a litany of bad choices. 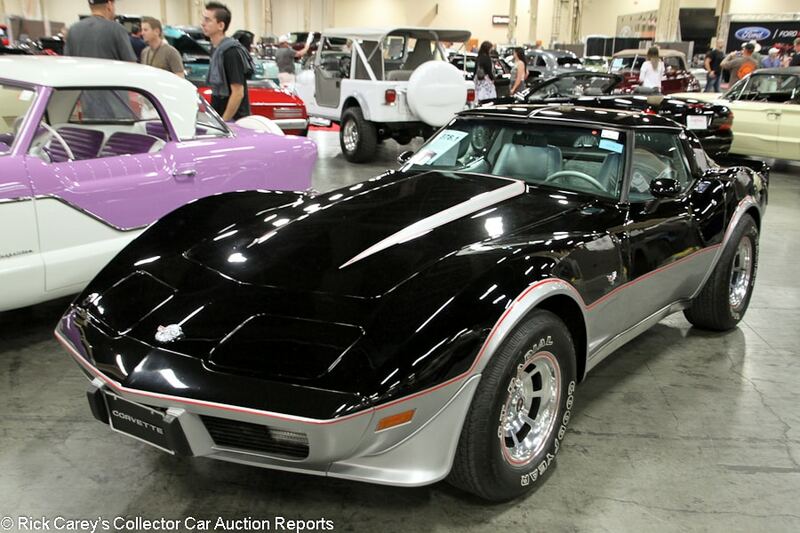 Lot # 378.1 1978 Chevrolet Corvette Pace Car Coupe; S/N 1Z87L8S905227; Black, Silver/Silver; Unrestored original, 2- condition; No Reserve; Hammered Sold at $34,000 plus commission of 10.00%; Final Price $37,400. – 350/220hp, automatic, Pace Car graphics not applied (no word on whether they come with the car or not, either), glass T-Tops, factory radio, power windows, air conditioning. – Represented as 1,379 miles. One of the many Pace Car ’78s to have only been driven only a few times and be treated as a collectible from new. The paint is showing its age with some detail scratches and the seats show mild wrinkling so it’s not the world’s best, but it still presents like a car that is almost new. – A straightforward and appropriate result for one of these Corvettes, which has always been more collectors item than sports car. If the paint is original it is in fabulous condition, most Pace Cars having required a repaint at Chevrolet’s expense. Lot # 385 1995 Chevrolet Corvette ZR-1 Coupe; S/N 1G1YZ22J8S5800103; Admiral Blue/Gray leather; Unrestored original, 2- condition; No Reserve; Hammered Sold at $35,000 plus commission of 10.00%; Final Price $38,500. – 350/405hp, 6-speed, Eagle F1 tires, power windows, air conditioning, power seat. – A few tiny chips on the nose and a few scrapes on the bottom front lip. Other than that and light wrinkling to the seats, this looks like a car with far fewer than the 32,800 miles represented. From the last year of ZR-1 production and finished in arguably the best color. – This is strong money for a ZR-1 with flaws and miles when so many were put away in their factory wrapping and are still coming out of the woodwork in near showroom condition. 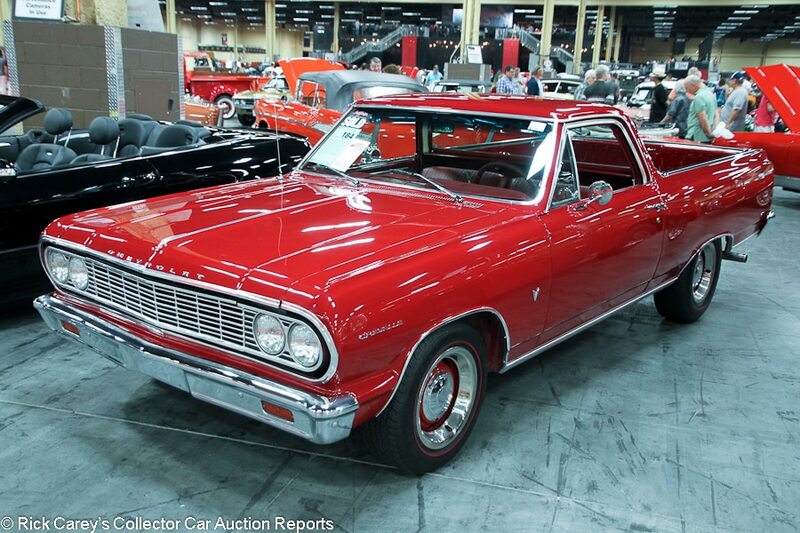 Lot # 184 1964 Chevrolet El Camino Pickup; S/N 45680L148205; Ember Red/Red vinyl; Visually maintained, largely original, 3+ condition; No Reserve; Hammered Sold at $19,000 plus commission of 10.00%; Final Price $20,900. – 327/250hp, automatic, hub caps and trim rings, Silvertown red line tires, bench seat, column shift, Sun tach mounted on the steering column, later cassette stereo, Stewart Warner underdash gauges. – Single family ownership and single repaint in the original color. Lightly worn dash. Good repaint. Uneven gaps. The chrome and brightwork are a little tired but not bad. There is some red overspray on the underbody, which is otherwise very sound. A long time Southern California kept intact by careful ownership and a sympathetic climate. – This isn’t really an exceptional El Camino in any way, but it’s handsome and honest, which was apparently enough to command this strong result. Lot # 430 1970 Chevrolet El Camino 454 Pickup; S/N 136800K212437; Fathom Blue, Black stripes and vinyl roof/Black; Older restoration, 2+ condition; No Reserve; Hammered Sold at $63,000 plus commission of 10.00%; Final Price $69,300. – 454/360hp LS5 engine, automatic, Rally wheels, Radial T/A tires, hood pins, bucket seats, column shift, later cassette stereo, power steering, factory air conditioning. – Represented as a matching numbers LS5 El Camino, making it pretty rare. Very good paint and chrome. The bed is tidy and dent-free. Very good fully restored interior. Spotless underneath. Freshly and fully restored to standards that are fitting for such a special El Camino. Looks ready to light up the rear tires. – This example sold at Mecum Kissimmee last year for $38,500, but this isn’t the only rare El Camino to see big bucks at auction this year. Mecum sold another LS5 in Portland this year for $52,250, an LS6 in Harrisburg for $134,750 and an extremely rare L89 in Kissimmee for $154,000. In context, this is a rare Camino with tire-melting power. The result may be double the value of a more ordinary Camino, but this is more than double the car. 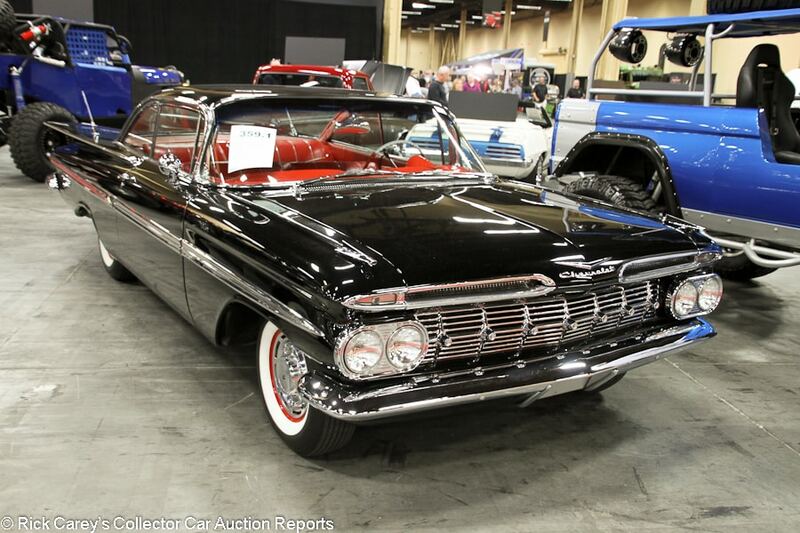 Lot # 359.1 1959 Chevrolet Impala 2-Dr. Hardtop; S/N F59L200054; Tuxedo Black/Red vinyl with pattern cloth inserts; Older restoration, 2- condition; No Reserve; Hammered Sold at $50,000 plus commission of 10.00%; Final Price $55,000. – 283/230hp, Powerglide, wheel covers, whitewalls, dual mirrors, dual antenna, power steering, power brakes, factory radio, rear seat speaker. – Light scratches on the rear bumper and left front fender. Otherwise sound but older paint and chrome. Uneven gaps. Good restored interior. Very tidy underneath. Body-off restored, but finished a while ago and done only to local show standards despite being represented as a ‘Fresh frame-off restoration.’ Not represented as matching numbers. – For a car with no represented history or paperwork as well as an older if admittedly high quality restoration, this was a generous price in a market that has otherwise been fairly flat for ’50s Chevys. 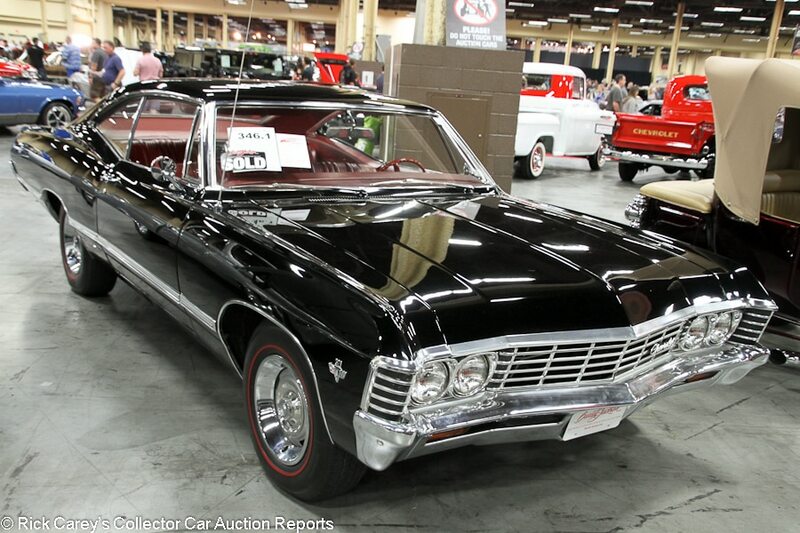 Lot # 346.1 1967 Chevrolet Impala 2-Dr. Hardtop; S/N 164877J209741; Tuxedo Black/Red vinyl; Visually maintained, largely original, 2 condition; No Reserve; Hammered Sold at $35,000 plus commission of 10.00%; Final Price $38,500. – 327/275hp L30 engine, 4-speed, Rally wheels, red line tires, dual mirrors, bench seat, floor shift, factory radio, rear seat speaker, factory air conditioning replaced with a modern system, Positraction. – Very good paint. Phenomenally well kept original interior. Looks original underneath. A very well kept sleeper of a car with one repaint and represented to have only 35,843 miles from new. – Sold by Mecum at Anaheim in November 2013 for $21,400, at Mecum Houston in April 2014 for $40,500 and at Barrett-Jackson Scottsdale this year for $24,200, which was a very good value. From the fluctuations it would seem that bidders don’t have a consistent idea what this Impala is worth, never a good situation in any marketplace, particularly for a fairly common model and driveline. The seller turned a good profit from January, the buyer paid long money for a frequently-auctioned car. 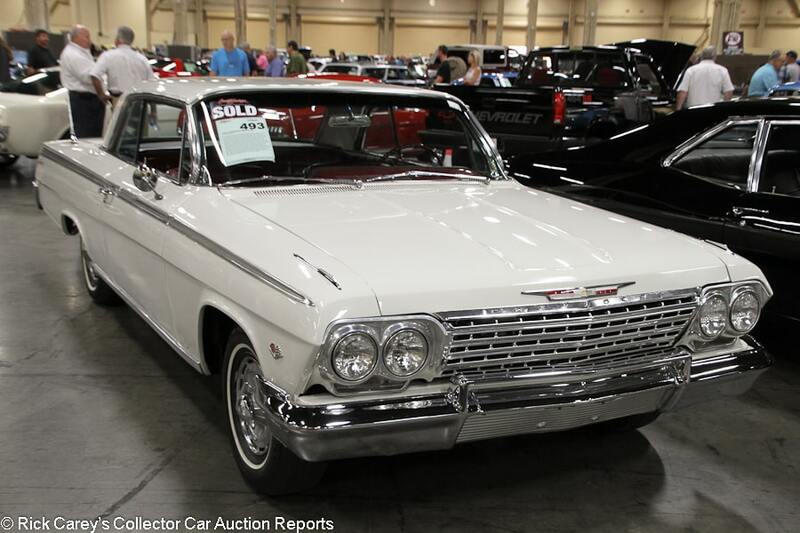 Lot # 493 1962 Chevrolet Impala SS 2-Dr. Hardtop; S/N 21847S301841; Ermine White/Red vinyl; Visually maintained, largely original, 2 condition; No Reserve; Hammered Sold at $30,000 plus commission of 10.00%; Final Price $33,000. – 283/230hp, Powerglide, narrow whitewalls, dual mirrors, dual antenna, bucket seats, column shift, console, dash clock, pushbutton radio, factory air conditioning with modern compressor, power steering, power brakes, rear seat speaker. – Represented as all original other than a single repaint in the original Ermine White and 36,599 miles from new. Very good paint and original brightwork. Small touch up and a paint run above the driver’s window. Remarkably well kept original interior. Very good underneath. An attractive car in attractive colors. Never restored because it never needed to be. 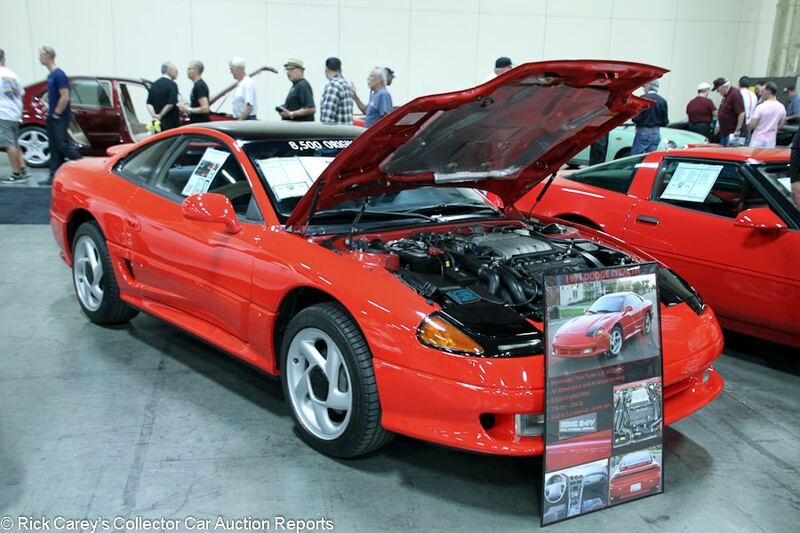 – This is a mundane, ordinary Impala SS that a dealer would have ordered to be eye-catching in the showroom or on the front line of the lot, a $25,000 car raised to $33,000 by its originality and claim of low original miles. How did it (or the many other cars at auction claiming original miles but titles exempt due to age) survive a half century, or more importantly the first five years of its life getting only 5,000 miles/year? In 1962 it cost $3,000 and that was not chump change back in 1962 when the Social Security Administration estimated the median family income was just under $4,300. Anyone who bought this car drove it, because they had no other economic choice. The buyers did not feel that skepticism, however, and took both the fine condition, apparent preservation and represented miles as the basis of this price. 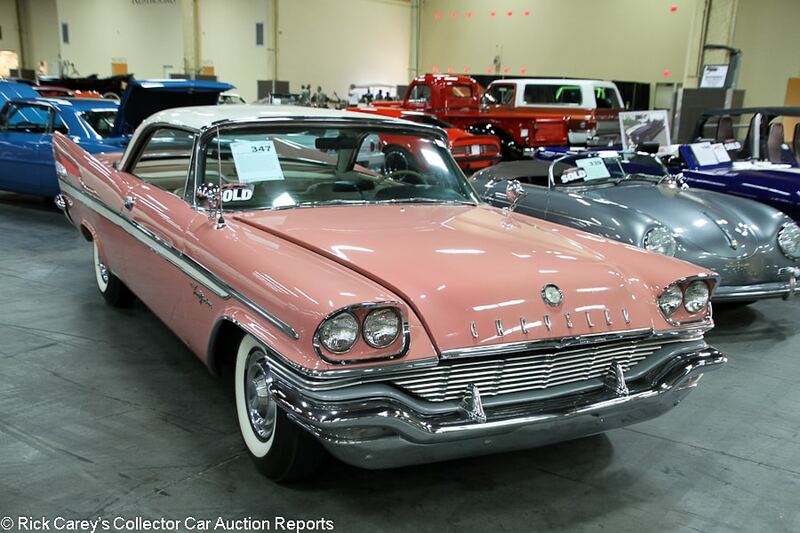 Lot # 347 1957 Chrysler New Yorker 2-Dr. Hardtop; S/N N575806; Sunset Rose, White roof/Beige vinyl; Visually maintained, largely original, 3+ condition; No Reserve; Hammered Sold at $19,500 plus commission of 10.00%; Final Price $21,450. – 392/325hp Hemi, automatic, wheel covers, whitewalls, dual mirrors, pushbutton radio, dash clock, heater, power steering, power brakes. – First bought by a judge in PA then stored for 30 years. Brought back to running condition in the 1990s and has received a single repaint and mechanical work when necessary, but has never been restored. Represented as 48,511 original miles. The paint is mostly good but there are some small touch ups on the nose and hood as well as a large chip out of the left edge of the hood. The doors stick out at the bottom. There is some discoloration on the seats and some of the switchgear is worn, but the interior has held up very well for its age. Solid underneath. An attention grabbing car from the first year of the Forward Look design, and an ideal cruiser. – Sold by Russo and Steele at Monterey two months ago for $16,500 and perhaps fluffed up a bit for Vegas (what could be more appropriate?) this is a sound example of ‘The Forward Look’ in an attractive color combination that struck a chord with the Las Vegas bidders (maybe the color?) and brought the consignor a small but not insignificant profit for the effort. Lot # 327.1 1947 Chrysler New Yorker Club Coupe; S/N 7044044; Dark Blue/Blue, Tan cloth; Visually maintained, largely original, 3+ condition; No Reserve; Hammered Sold at $15,000 plus commission of 10.00%; Final Price $16,500. – Hub caps and trim rings, wide whitewalls, dual mirrors, column shift Fluid Drive, factory pushbutton radio, dash clock. – The grille is lightly pitted but still shiny, and the headlight bezels are lightly scuffed. The bumpers have been rechromed and look very good. Very good single repaint. Very good restored interior other than a scratch on the glovebox and lightly faded gauge faces. The hub caps have a few scratches and dents, and the underbody is tidy but unrestored. This car has a lot of little flaws but tons of eyeball and a great presence in these colors. It would make a great driver or event car. – Sold at Russo and Steele Monterey last year for $19,250. This is a better car than these prices suggest, but it’s a Club Coupe and the sides are steel, not Town & Country wood, limiting its appeal. 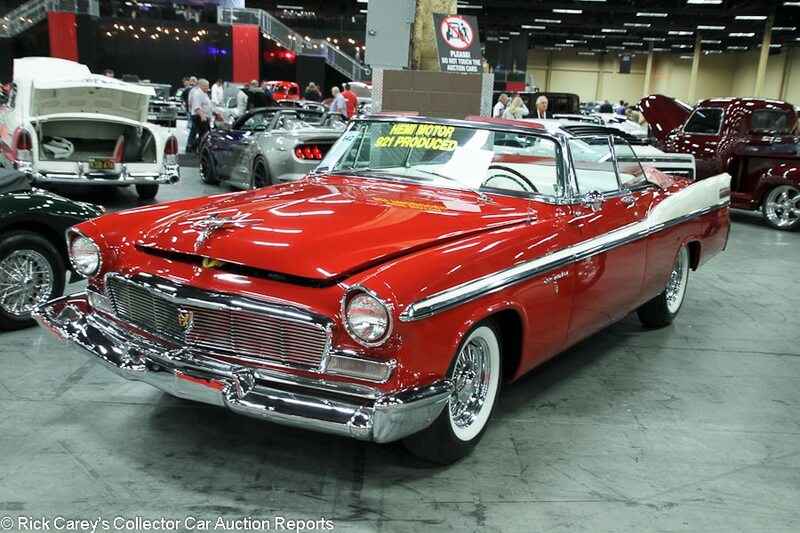 Lot # 642 1956 Chrysler New Yorker Convertible Coupe; S/N N562695; Regimental Red, White/Red, White; Older restoration, 3+ condition; No Reserve; Hammered Sold at $40,000 plus commission of 10.00%; Final Price $44,000. – 354/280hp Hemi engine, wire wheels, whitewalls, hood ornament, boot cover, pushbutton automatic, Town & Country radio, power windows, power top, power seat, power steering. – The paint is a lighter shade above the coach line than below, and there are several chips and scratches around the trunk. The brightwork is all lightly scratched up, and there is a small flake off the grille. The interior is good, although some of the switchgear is dull. A handsome and inherently collectible car, but flawed and deserves better. – Not quite the functional equivalent of a 300B with a top that goes down, even with the abundant flaws the buyer got a rare, attractive and good-performing car for a moderate price. A ’56 Plymouth Belvedere convertible in comparable condition would cost nearly this much and this is a Chrysler with a Hemi. 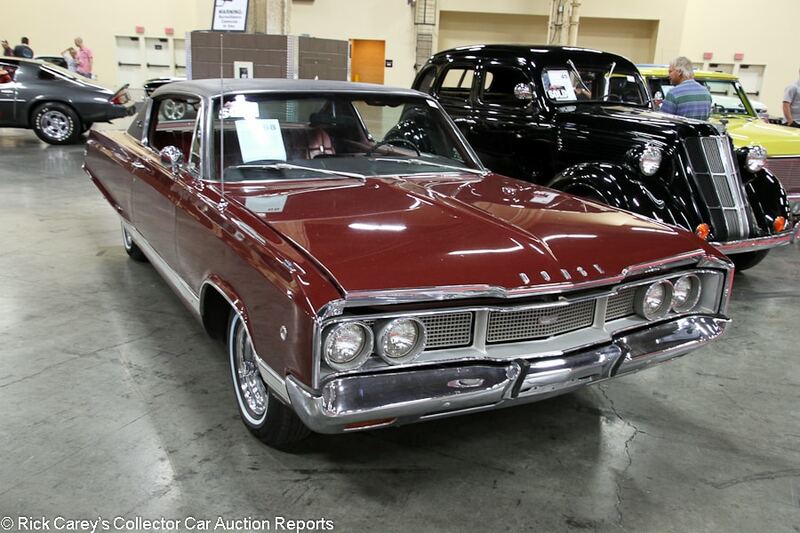 Lot # 68 1968 Dodge Monaco 2-Dr. Hardtop; S/N DH23H8D272525; Red, Black vinyl roof/Red; Unrestored original, 4+ condition; No Reserve; Hammered Sold at $6,700 plus commission of 10.00%; Final Price $7,370. – 383/290hp 2-barrel, automatic, narrow whitewalls, pushbutton radio, dual mirrors, power steering, power brakes, air conditioning. – Reported to run and drive but in barn find condition essentially. Showing 99,882 miles and represented as matching numbers. Faded paint and chrome. Numerous chips and fisheyes on the hood. The interior is mostly solid but there are several rips in the driver’s seat. Fairly worn and oxidized underneath. A sound project car. – This is a project car bought for project car money and nothing that will ever raise endorphins. Lot # 345.1 1955 Dodge Royal Lancer 2-Dr. Hardtop; S/N 34939507; Heather Rose, Black, White roof/White leather with Black cloth inserts; Enthusiast restoration, 3+ condition; No Reserve; Hammered Sold at $22,000 plus commission of 10.00%; Final Price $24,200. – 270/183hp Polysphere V-8, automatic, wheel covers, whitewalls, dual mirrors, power steering. – Represented as a recent restoration. Mostly good paint and chrome. The headlight bezels have orange peel and don’t fit right, and there is a long scratch at the back of the hood as well as a crack on the left front fender. Good bumper chrome, but the rest of the brightwork is a bit dull. Some discoloration on the white parts of the seats and the dash is unrestored. Sound underbody. A good enough enthusiast restoration, but nothing special. – ‘Recent restoration’? This car looks much the same as it did in 2005 when Silver Auctions sold it at Ft. McDowell for $14,850. It’s a fun 50’s Dodge, and this is all it’s worth, and then some. Lot # 91 1991 Dodge Stealth R/T Hatchback; S/N JB3XE74CXMY003445; Red, Black Roof/Gray cloth; Unrestored original, 2- condition; No Reserve; Hammered Sold at $16,000 plus commission of 10.00%; Final Price $17,600. – 181/320hp twin turbo, Getrag 5-speed, alloy wheels, active rear spoiler, all-wheel drive, four-wheel steering, rear window wiper, power windows, air conditioning, cassette stereo, documented with the original window sticker. – The window sticker shows that this car cost $29,600 when new and currently still presents like a new car. It shows 8,198 believable miles which are represented to be all it has covered in a quarter century with only two owners. The engine bay doesn’t look factory fresh, but it was recently detailed. The paint and interior look new. – A Mitsubishi 3000GT VR4 under the skin with Dodge badges, this car was even built in Japan. Stealths therefore have all the high-tech goodies and performance of the Mitsubishis that made them a top performer in the ’90s, but the Dodge versions tend to command a few grand less. The technology in these cars is impressive even today and as interest grows for ’90s performance cars prices for the 3000GT/Stealth are likely to grow, but this result was ahead of the curve even though it bought a top quality car. 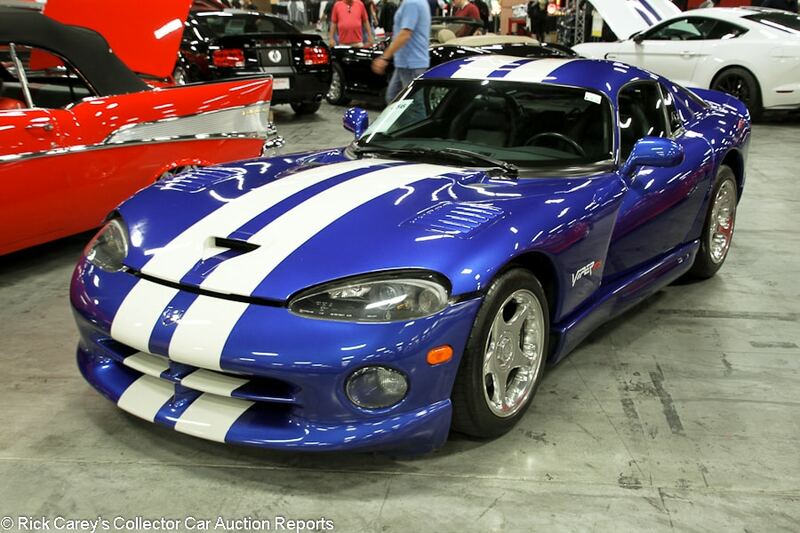 Lot # 456 1996 Dodge Viper GTS Coupe; S/N 1B3ER69E9TV200879; Blue, White stripes/Black Leather; Unrestored original, 2- condition; No Reserve; Hammered Sold at $46,000 plus commission of 10.00%; Final Price $50,600. – 488/415hp, 6-speed, Michelin Pilot Sport tires, power windows, air conditioning, CD stereo. – There are a handful of tiny chips on the nose and hood vents as well as one on the driver’s door. Otherwise, it presents like a new car and with less than 9,574 miles showing and represented to be from new, it just about is. – When the Viper GTS was introduced in 1996, it cost well over 60 grand. Prices then bottomed out a couple of years ago and auction results for these cars seem to be getting stronger and stronger. This result shows that trend continuing. 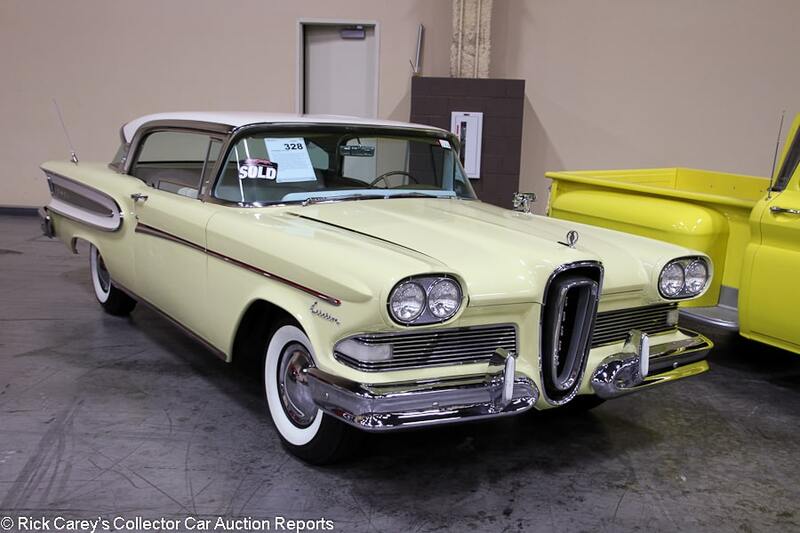 Lot # 328 1958 Edsel Citation 2-Dr. Hardtop; S/N X8JW701337; Jonquil Yellow, White Roof/White; Unrestored original, 2- condition; No Reserve; Hammered Sold at $22,000 plus commission of 10.00%; Final Price $24,200. – 410/345hp, wheel covers, whitewalls, Teletouch automatic, Town & Country radio, compass, factory air conditioning (not functional), power steering. – Remarkable original paint with a handful of chips in the body, the only major ones of which are on the back right corner of the hood and at the bottom of the right C-pillar. Newer tires. Very good chrome and brightwork. The bumpers appear to have been rechromed. Uneven gaps. Very good lightly worn original interior. Amazingly clean underneath. This must be one of the better unrestored Edsels that exist. Its attractive colors are icing on the cake. – Except for the committed Edsel wonk (of which there are a few) the Edsel to have is the first year 1958 with its characteristic horse-collar grille, bright paint colors and the big 410 cid engine. After that it all went into the hopper quickly. This Citation’s preservation is remarkable but it was bought with little credit for its originality and equipment and represents an unusually good value at this price. 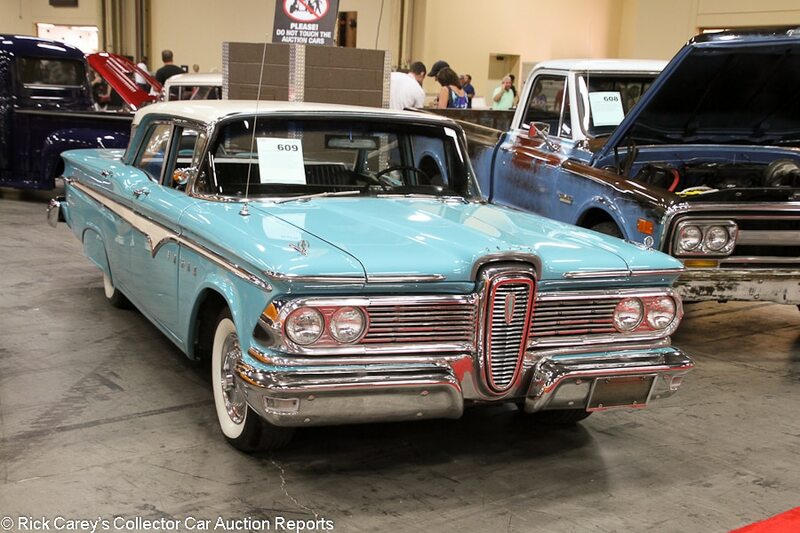 Lot # 609 1959 Edsel Ranger 4-Dr. Sedan; S/N C9UF738703; Light Aqua, White/Black; Unrestored original, 3+ condition; No Reserve; Hammered Sold at $10,000 plus commission of 10.00%; Final Price $11,000. – 292/200hp 2-barrel, wheel covers, whitewalls, fender skirts, Continental kit, aftermarket cassette stereo, dash clock, Sunpro underdash gauges. – The original paint was wet sanded then clear coated, and now looks very good. The rest of the car is original. The chrome and brightwork are lightly faded and scratched but are all sound. Panel fit is erratic. There are several touch ups on the cover for the spare wheel. Lightly scratched rear glass. Mellowed but very sound original interior. Very clean underbody. The tires are replacements, but the whitewalls are discolored. Showing 4,492 miles, but they are not represented as actual. This Edsel is too good to restore, and would best serve as an attractive driver. – Appropriately given a premium for its high level of preservation. Like Corvairs, Edsels are a somewhat stigmatized classic that have never been particularly valuable and probably never will be, but that just presents an opportunity for enthusiasts on a budget. This car, even with its base 2-barrel engine and mundane 4-Door Sedan body will be an eye-catching cruiser at a modest price. 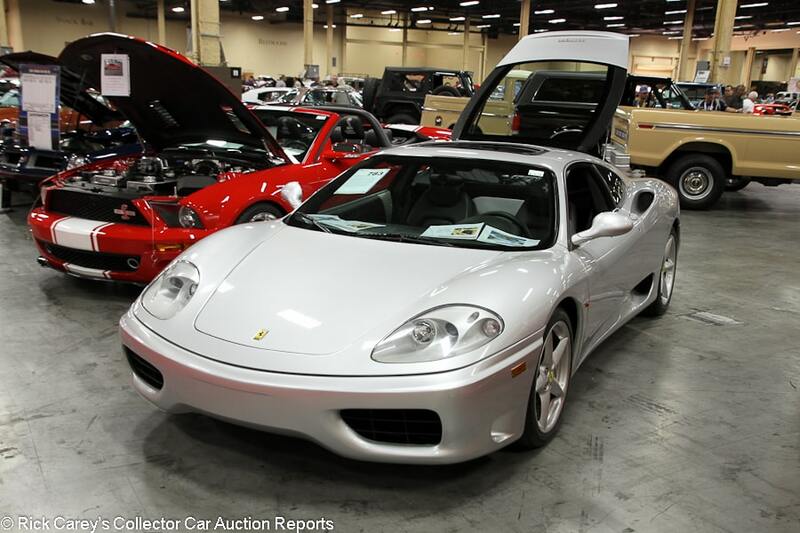 Lot # 783 2001 Ferrari 360 Modena F1 Coupe; S/N ZFFYU51A110123613; Silver/Black leather; Unrestored original, 2- condition; No Reserve; Hammered Sold at $62,000 plus commission of 10.00%; Final Price $68,200. – Bridgestone tires, sunroof, F1 gearbox. – This car is mostly unremarkable with its 24,000 miles and bland colors, but the sunroof is a rare option since it cost 16 grand when new. The seats and steering wheel show mild wear but this car is otherwise flawless. Represented with a belt service, but nothing else. 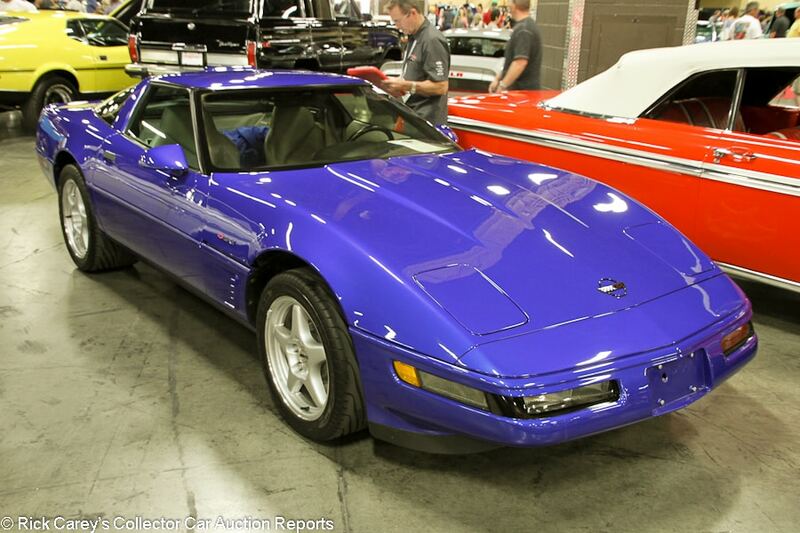 – Sold at Barrett-Jackson Scottsdale this year for $88,000. These cars are old enough that they are no longer depreciating but starting to become collector Ferraris. This smaller result was more down to the people in the auction room (who probably thought it would be worth more with a clunky manual gearbox) than anything, and is on the low end for a good 360, especially with the sunroof. 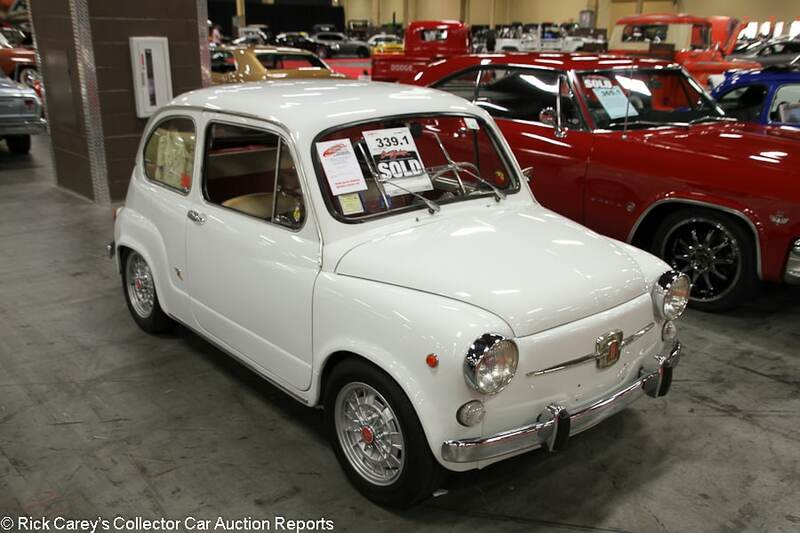 Lot # 339.1 1967 Fiat 600 2-Dr. Sedan; S/N 100D2240168; White/Red, White vinyl; Enthusiast restoration, 3 condition; No Reserve; Hammered Sold at $23,000 plus commission of 10.00%; Final Price $25,300. – Campagnolo wheels with Abarth caps, Abarth (?) carburetor, aftermarket suspension. – Several chips and scratches on the nose as well as below the windshield. The trim on the drip rail is loose and wiggles freely at each end. Pitting on the rear bumper. Very good interior. This is a cute driver, nothing more. – Ah, but cute counts and anyone plotting to buy a Road Runner Hemi had best keep in mind that when a significant other says, ‘Oh, honey, that’s so cute’ it’s time to act. Even at that, though, this isn’t an unreasonable result for a decent, drivable and adorable little 600. Lot # 625 1989 Ford Bronco Wagon 4×4; S/N 1FMEU15N6KLB49577; Raven Black/Charcoal cloth; Unrestored original, 2 condition; No Reserve; Hammered Sold at $37,000 plus commission of 10.00%; Final Price $40,700. – 302/185hp, automatic, Goodyear Wrangler AT tires, cassette stereo, power windows, tow package, handling package, woodgrain dash trim. – Supposedly used by Ford as a promo vehicle and showing 1,612 represented original miles. The exhaust tip has some rust on it but otherwise this Bronco looks showroom fresh, as its incredibly low mileage would suggest. – Given how hot earlier Broncos have been, it was only a matter of time before we started seeing the later ones coming out of the woodwork and crossing the block at auction. This like-new example is pretty much the cream of the crop as far as fourth gen Broncos go, but the price is out of this world. This was one of the more surprising sales of the auction and only encourages more of these trucks to come to market, balancing the ever-present Land Cruisers. Lot # 122 1972 Ford F-100 Styleside Short Bed; S/N F10YCN70934; White, Brown/Tan vinyl; Modified restoration, 2+ condition; No Reserve; Hammered Sold at $24,000 plus commission of 10.00%; Final Price $26,400. – 351/153hp now said to have a 360, automatic, aftermarket wheels, narrow whitewalls, column shift, Philco radio. – Very good paint and chrome. Straight brightwork. Very good interior. Fresh, clean underbody. A fresh restoration in attractive colors done to better than truck standards. 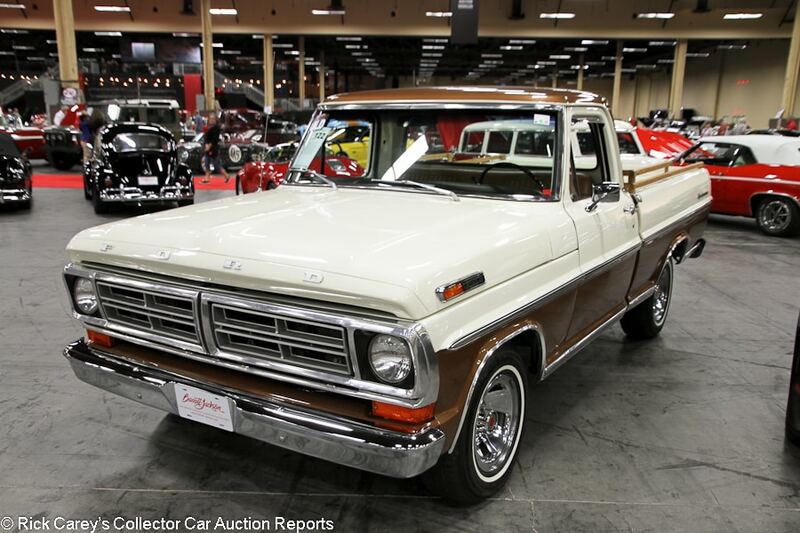 – After diddling around for four years in the mid-teens (sold for $17,655 at Mecum Indy in 2013, $16,500 at both Mecum Harrisburg and here in 2015) this F100 struck paydirt in Vegas. No one will ever know ‘why’, but the seller must be lighting candles at the B-J altar. 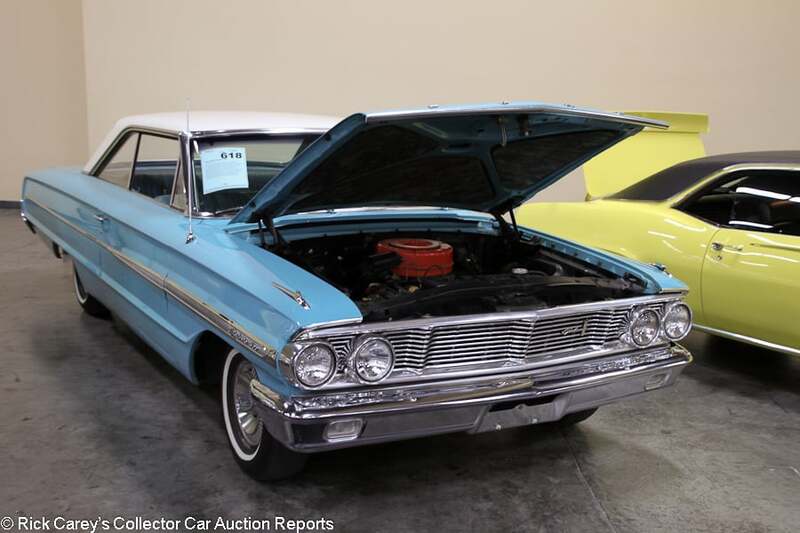 Lot # 618 1964 Ford Galaxie 500 2-Dr. Hardtop; S/N 4D66C127517; Skylight Blue, White roof/Blue vinyl with cloth inserts; Unrestored original, 3+ condition; No Reserve; Hammered Sold at $18,000 plus commission of 10.00%; Final Price $19,800. – 289/195hp 2-barrel, column shift 3-speed, wheel covers, whitewalls, dash clock, factory radio. – Represented with 39,962 original miles and as a totally original car. The engine bay is showing its age but appears to have always been maintained with fresh hoses and wires. The paint has a handful of small chips and scratches, but looks fantastic and it’s hard to believe it’s as old as it is. The interior shows some light aging but no wear to speak of. This is a fantastic time capsule car that should never be restored. 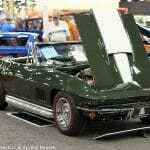 – This car also sold for $17,600 at Barrett-Jackson Scottsdale this year. Neither result recognizes the remarkable level of preservation, and the new owner could have spent closer to 25 grand without overpaying even with the mundane drivetrain. 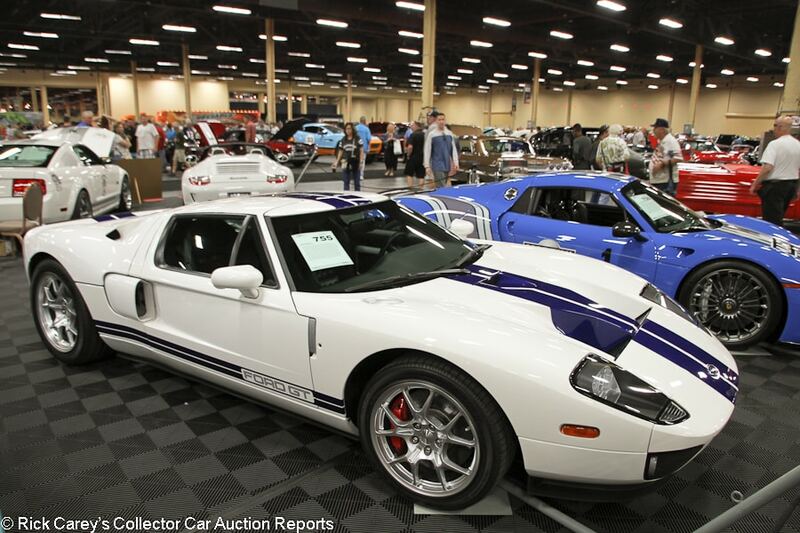 Lot # 755 2005 Ford GT Coupe; S/N 1FAFP90S15Y401888; Centennial White, Blue stripes/Black; Unrestored original, 2 condition; No Reserve; Hammered Sold at $255,000 plus commission of 10.00%; Final Price $280,500. – All four options (stripes, BBS wheels, painted calipers, McIntosh stereo). – Represented with 10,600, which is high mileage in the world of Ford GTs. Nevertheless, it presents like a new car, just like they all do. – The only things distinguishing this car from other GTs that come to auction are its paint color and the mileage on its odometer. The Vegas bidders took the mileage into account and bid it to a price that can be considered modest but not cheap relative to other recent sales. 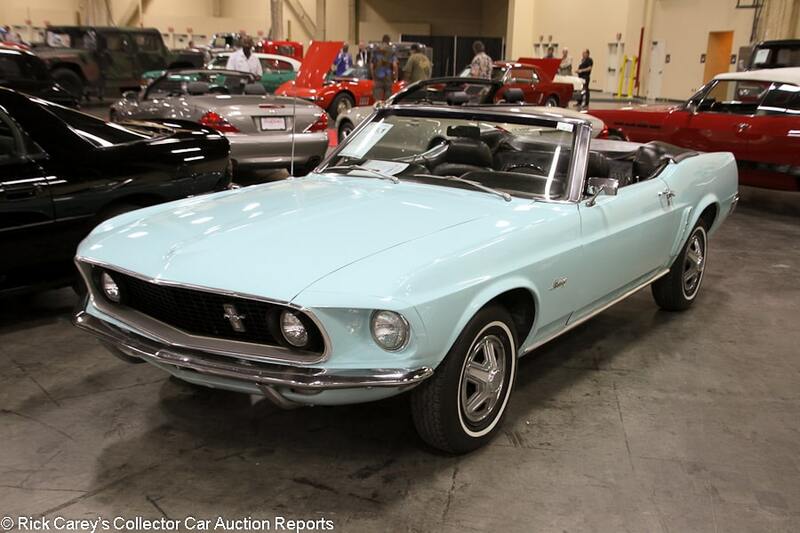 Lot # 99.1 1969 Ford Mustang Convertible; S/N 9R03F169203; Blue/Black vinyl; Visually maintained, largely original, 3+ condition; No Reserve; Hammered Sold at $16,000 plus commission of 10.00%; Final Price $17,600. – 302/220hp, automatic, wheel covers, narrow whitewalls, boot cover, bucket seats, floor shift, Philco radio, power steering, power top. – Represented as a two-owner car with 98,349 miles. Single repaint and newer top, but otherwise original. The paint is average quality, and there is a large touch up on the right side of the hood as well as a long scratch near the passenger’s door handle. Uneven gaps. Dull brightwork and taillight lenses. Dull, slightly faded gauges but mostly very good original interior. Well-kept and dry underneath. A mostly unremarkable first gen Mustang showing 98,349 miles, but it’s fundamentally sound and would make for a fun attention-grabbing weekend driver as-is. – A basic, honest car bought for basic money. 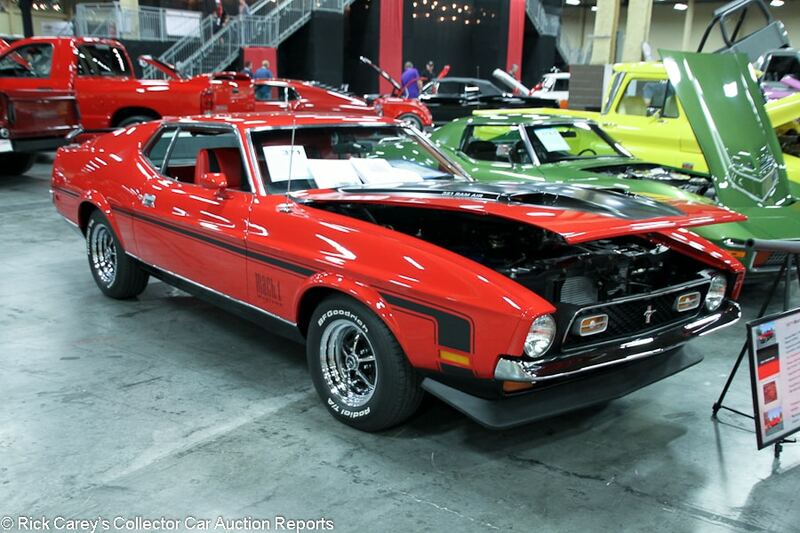 Lot # 371 1971 Ford Mustang Mach 1 SportsRoof; S/N 1F05H190027; Red, Black/Red, Black; Modified restoration, 2- condition; No Reserve; Hammered Sold at $40,000 plus commission of 10.00%; Final Price $44,000. – 351/240hp, automatic, Radial T/A tires, spoilers, console, floor shift, dash clock, pushbutton radio, Edelbrock intake, Holley 4-barrel, power steering, power brakes, modern air conditioning, modern aluminum radiator, Elite Marti report documented. – Tidy restored engine bay and underbody. Good older paint and chrome. Scratched up rear window and window frame. Very good newer upholstery and carpets, but the gauges are cloudy and dull. Restored, but some corners were cut and the Edelbrock/Holley intake suggests more than a few modifications, which is understandable given the relatively modest value. 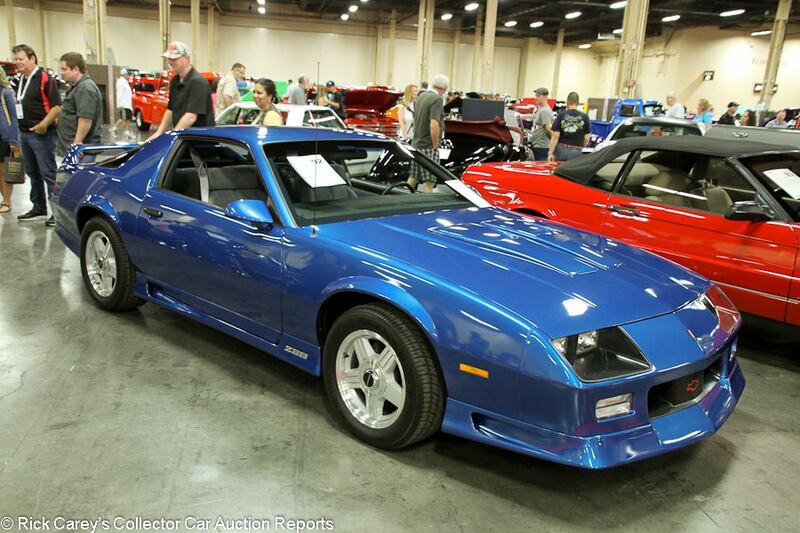 – Sold for $25,850 at Barrett-Jackson Orange County in 2012. Prices haven’t seen much movement for these cars in the past five years, so if the 2012 result was a bit modest then this price borders is nothing but generous even with A/C and all the other options. 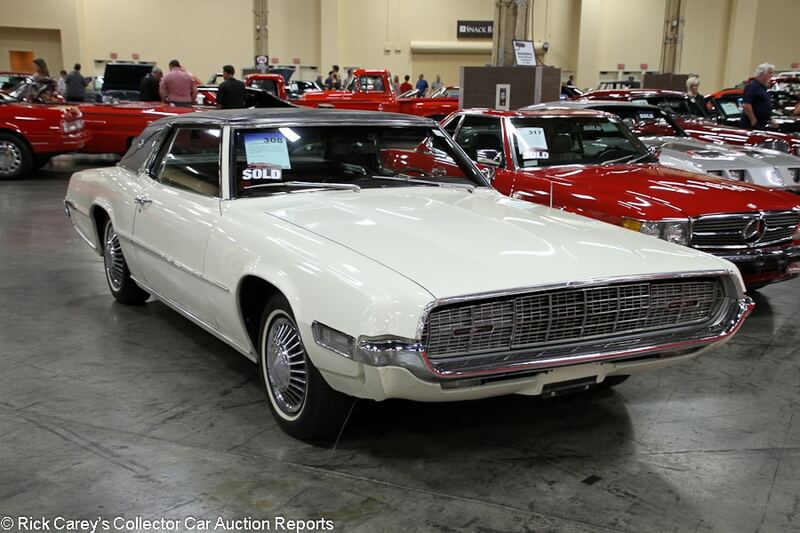 Lot # 308 1968 Ford Thunderbird Landau Coupe; S/N 8J84N118408; White, Black vinyl roof/Red vinyl; Visually maintained, largely original, 3+ condition; No Reserve; Hammered Sold at $6,000 plus commission of 10.00%; Final Price $6,600. – 429/360hp, automatic, wheel covers, narrow whitewalls, bucket seats, console, column shift, power windows. – Parked from 1984 until 2011, then mechanically restored. Showing 48,852 miles. Very good original paint with only a handful of small chips. Small dent in the right front fender. The underbody is sound but unrestored. The engine bay is showing age but has been restored and cleaned up. Very good, very lightly worn original interior. This car has the benefit of the barn find look but fresh mechanicals underneath. – Bought for project car money, but someone else has gone to the trouble of doing the hard mechanical work already, making this a solid deal. Lot # 418.1 1956 GMC 1/2-Ton Pickup; S/N 1018PY9569; Turquoise, Ivory/White vinyl with Blue cloth inserts; Truck restoration, 2- condition; No Reserve; Hammered Sold at $53,000 plus commission of 10.00%; Final Price $58,300. – 316/180hp, 4-speed, hub caps and trim rings, Firestone whitewalls, wood bed floor, windshield sun visor, floor shift, step side body. – Some gloppy paint in the GMC emblem on the nose. Uneven gaps. Masking errors in the paint. Spotless restored frame. Excellent interior. A body-off restored truck in attractive colors with only a handful of small things to pick on. 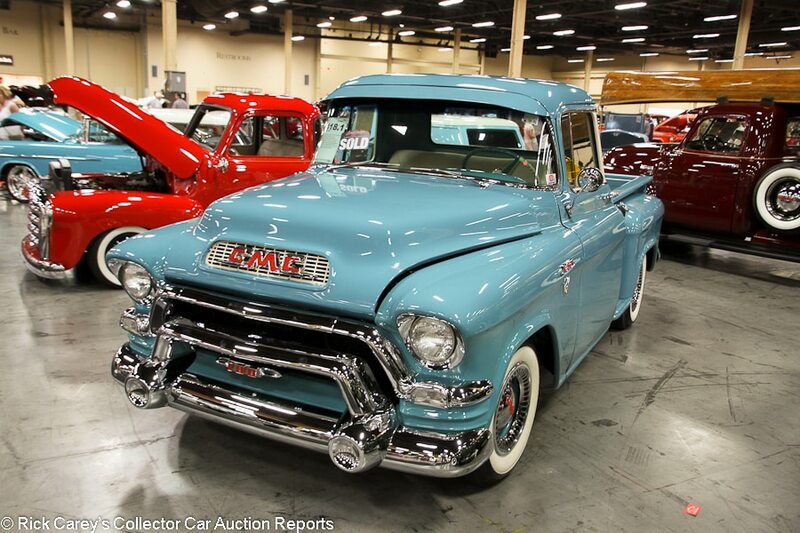 – This GMC has been restored to show pickup truck standards and it glistened in the bright auction lights with its quality paint, sharp chrome and pristine interior. It brought near-Cameo money, and deserved every penny. Lot # 397.2 1972 GMC Jimmy Open Top Utility; S/N TKE182S510518; Light Blue, White Top/White vinyl with Blue cloth inserts; Modified restoration, 2+ condition; No Reserve; Hammered Sold at $45,000 plus commission of 10.00%; Final Price $49,500. – Represented with a 350/360hp small-block, power brakes, power steering, air conditioning, LT1 appearance package, bucket seats, console, floor shift, aftermarket stereo, lift kit, 33-inch tires. – Spotless restored engine bay and underbody. Very good recent paint and chrome. Some of the weather stripping on the top is loose. Otherwise the interior is fantastic. A gorgeous truck from top to bottom from the final year of the first gen Jimmy. Restored to notably better than truck standards. 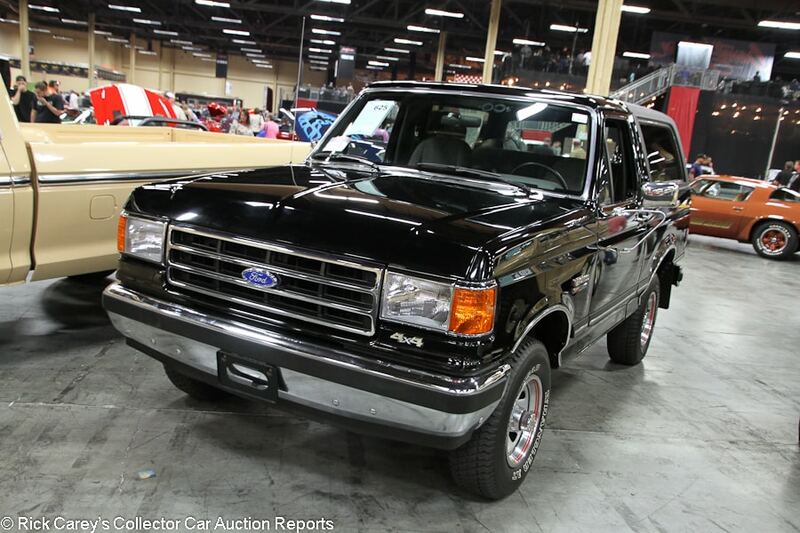 – Anything that was a Jimmy or a Blazer was absolutely on fire at this Las Vegas auction. 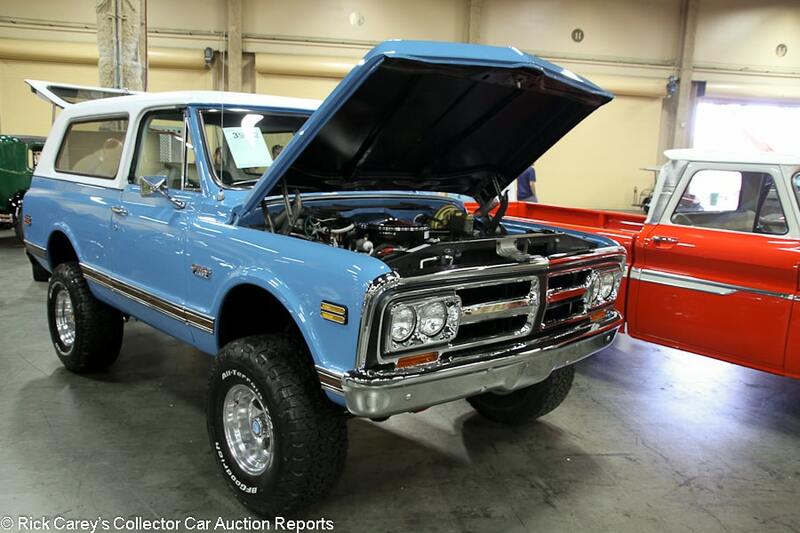 A tastefully modified ’70 Jimmy brought $77,000, and a like-new ’82 Blazer sold for $44,000. The list goes on, and this ’72 was just as shocking. Some have speculated that what has happened to Bronco values is bound to trickle down to Blazers and Jimmys. It appears that they were right. Lot # 98 1978 GMC Sierra Classic 1500 Fenderside Pickup; S/N TCL448J517623; Cardinal Red/Red; Unrestored original, 2 condition; No Reserve; Hammered Sold at $21,000 plus commission of 10.00%; Final Price $23,100. – 350/165hp, automatic, trim rings, column shift, factory AM radio, factory air conditioning, power steering, power brakes, dash clock, tinted glass, rear step bumper, tilt steering column, dual outside mirrors, side window visors, chrome bed rails, mudguards, chrome bumpers with overriders. – Represented with 13,401 actual miles and original paint. The paint and chrome are both remarkable for the age. Other than one long and deep scratch, the bed looks like it has never had anything in it. The interior looks factory fresh. Light road wear underneath, but very sound. An old GMC that was hardly ever used and seemingly never used as intended, which makes for an ideal collector example. – While it is difficult to comprehend how this GMC survived in such benign original condition with such low miles it is impossible not to appreciate how good a truck it is. Anyone wanting a serious quality truck had to look no further than this Thursday lot, bid this much and go home gratified. 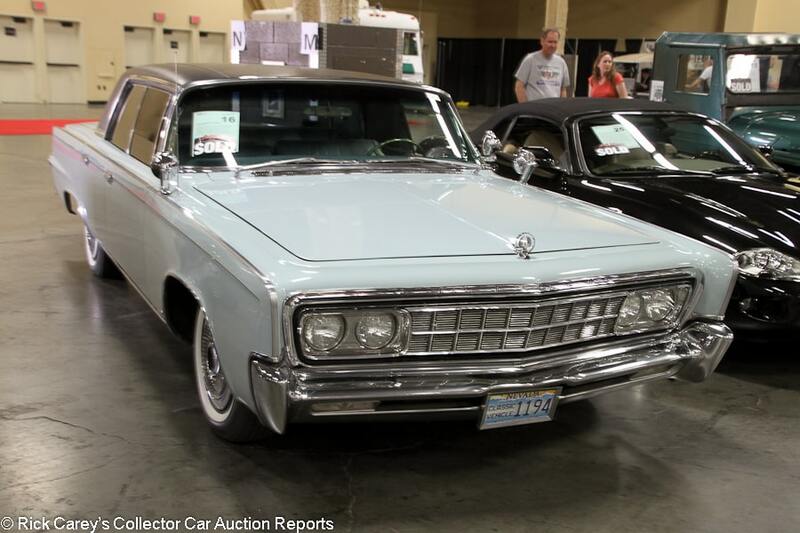 Lot # 16 1966 Imperial Crown 4-Dr. Hardtop; S/N YM43J63190967; Light Blue, Dark Blue vinyl roof/Slate Blue leather; Visually maintained, largely original, 3+ condition; No Reserve; Hammered Sold at $5,000 plus commission of 10.00%; Final Price $5,500. – Wheel covers, narrow whitewalls, spotlight, dual mirrors, tinted glass, column shift, CB radio, woodgrain dash. – Several scratches and touch ups on the nose and hood, but mostly good older paint. Decent original chrome and brightwork. Sound, straight roof vinyl. Very good original interior. A bit dirty but well-kept underneath. Slightly wavy body sides. Represented as a one-owner West Coast car that comes with many spares. It is almost totally original other than light use and a repaint. It looks very good for its age. – This is a prime example of how inexpensive it can be to join the old car hobby, and a darned good car, too. This is a modest price with absolutely no premium for preservation and while a 4-door hardtop may not be in prime car collecting country it’s still a car that will get positive attention as well as being comfortable and roomy. Its biggest drawback (beyond the four doors) is that it will take up a lot of room in the barn. 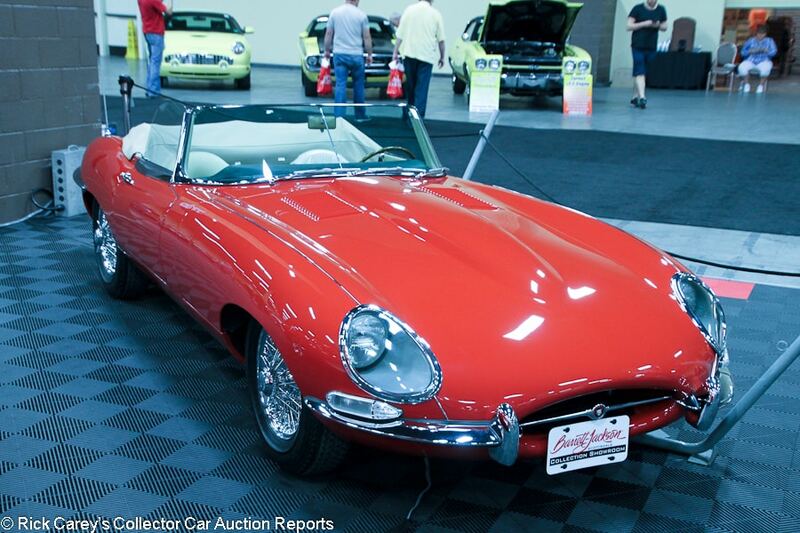 Lot # 661 1963 Jaguar XKE SI Roadster; S/N 877792; Carmen Red/Beige leather; Older restoration, 2- condition; No Reserve; Hammered Sold at $110,000 plus commission of 10.00%; Final Price $121,000. – 3.8/265hp, 4-speed, centerlock wire wheels, cloth boot cover, woodrim steering wheel, wood shift knob, BMC pushbutton radio, JDHT certificate documented. – Very good paint and chrome. The headlight bezels don’t quite fit flush with the body, and neither does the trunk lid. There is also some light discoloration on the boot cover and a few light scratches on the window trim. The interior is very good and lightly worn. Fully restored and very attractive example of an early 3.8 Roadster that has been driven a bit. – This result is appropriately discounted for light use on an otherwise gorgeous and high quality restored 3.8 Roadster. 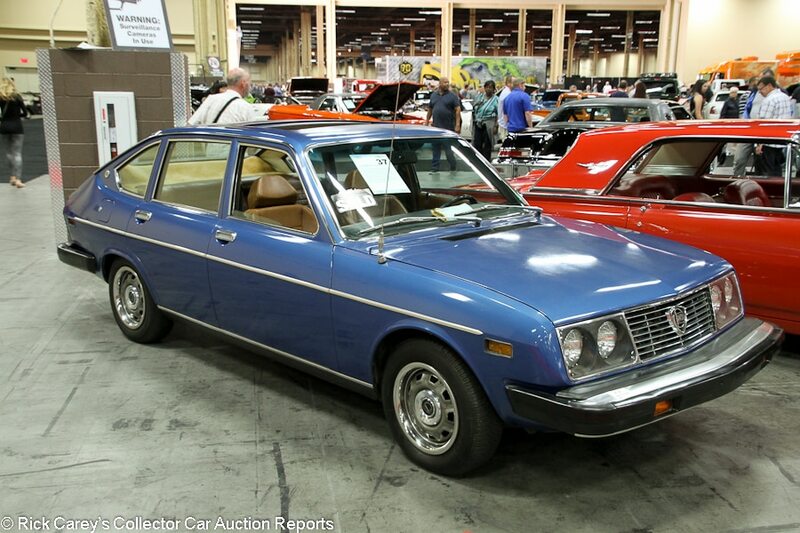 Lot # 37 1975 Lancia Beta 4-Dr. Sedan; S/N 828AB1501467; Blue/Brown vinyl; Unrestored original, 2- condition; No Reserve; Hammered Sold at $5,700 plus commission of 10.00%; Final Price $6,270. – 1756/86hp, 5-speed, hub caps and trim rings, sunroof, air conditioning, power windows, cassette stereo. – The paint is dull and original, particularly on the parts that face the sun, which are crazed and faded. The door handles are pitted, but only lightly. Road worn but tidy underneath. The interior is remarkable for a car showing 89,663 miles, represented as all it has covered from new, a claim backed up by its condition. Comes with a few boxes of NOS spares. All original with one owner since new and represented with a recent major service. This might be the best one in the country. – One of the oddest and most surprising cars of the auction was this rather unassuming old Beta. Even most of the sportier Lancias of this era have long since rotted away or have been lightly refurbished, so to see one of the more mundane sedan models in such good shape was shocking and yet another testament to the benefits of a dry climate on old cars. In terms of exclusivity per dollar, this might have been the best deal of the auction. 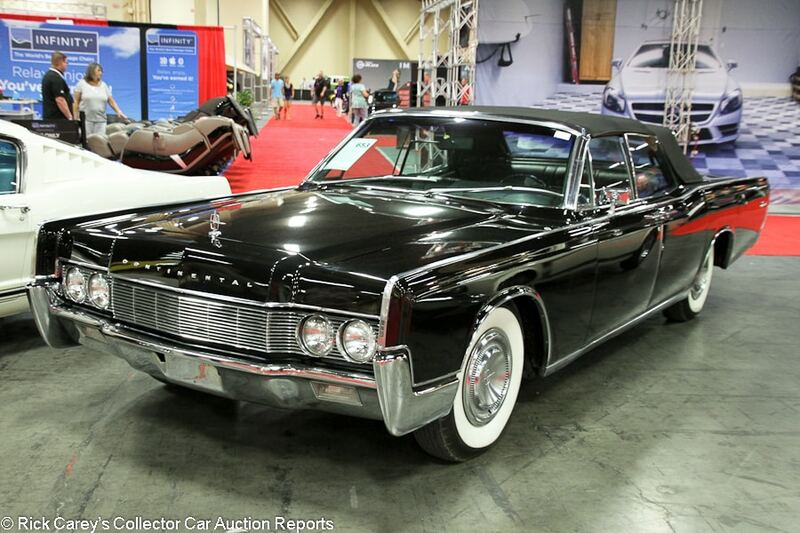 Lot # 653 1967 Lincoln Continental Convertible Sedan; S/N 7Y86G812559; Black/Black leather; Black Cloth top; Older restoration, 3+ condition; No Reserve; Hammered Sold at $39,000 plus commission of 10.00%; Final Price $42,900. – Wheel covers, whitewalls, power windows, power top, power steering, power brakes, dash clock, pushbutton radio, factory air conditioning, power seat. – Represented as restored, but no details other than that. The door handles are lightly scratched and pitted. The doors don’t quite fit flush with the body and there are chips at the back of the rear doors. The rest of the paint is good but older, and the interior is very good. Not a show car by any means, but attractive enough as-is to enjoy and get plenty of attention. – From the last year of the suicide door Continentals and one of the more valuable years for this body style. This one hammered not sold at a $37,500 high bid at Russo and Steele Monterey last year, then sold here a few months later for $56,100. It wasn’t a home run for the seller, but this result is a lot more realistic. 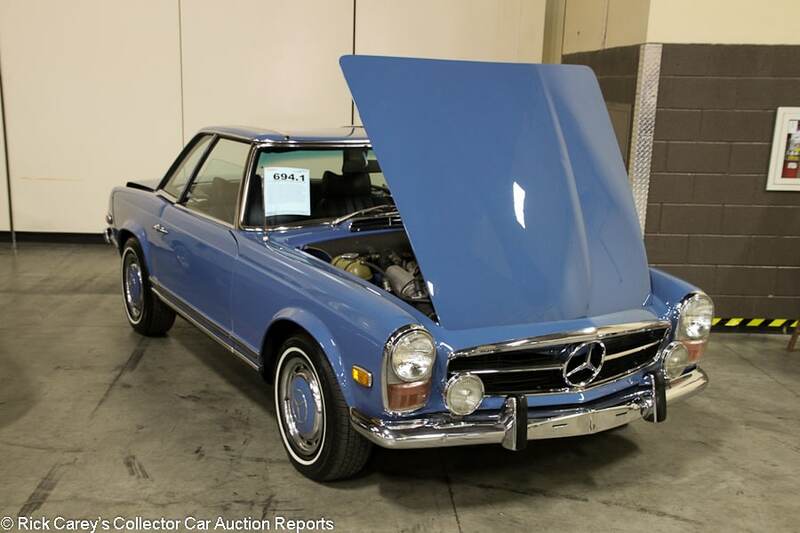 Lot # 694.1 1971 Mercedes-Benz 280SL Convertible; S/N 11304412021632; Blue, Blue hardtop/Blue; Older restoration, 2- condition; No Reserve; Hammered Sold at $60,000 plus commission of 10.00%; Final Price $66,000. – Automatic, wheel covers, narrow whitewalls, Becker Europa stereo, VDO dash clock, dealer installed air conditioning, fog lights. – Original colors. Represented as matching numbers. Tidy but used restored engine bay with heat rash on the exhaust manifold. Good paint and chrome. Lightly scratched window frames. Very good interior. Tidy underbody. A restored and lightly driven late Pagoda SL. – Pulled up by rising 300SL and 190SL prices a few years ago, the W113 Pagoda SLs got expensive around 2014. After the 300s and 190s peaked and retreated, these cars followed suit. This is a modest result for a pretty good example on the basis of recent transactions and suggests the outlook isn’t too good for them in the near future. The buyer, however, has the chance for a quick turnaround at a profit which is unusual at a B-J auction where results are usually full retail or more. 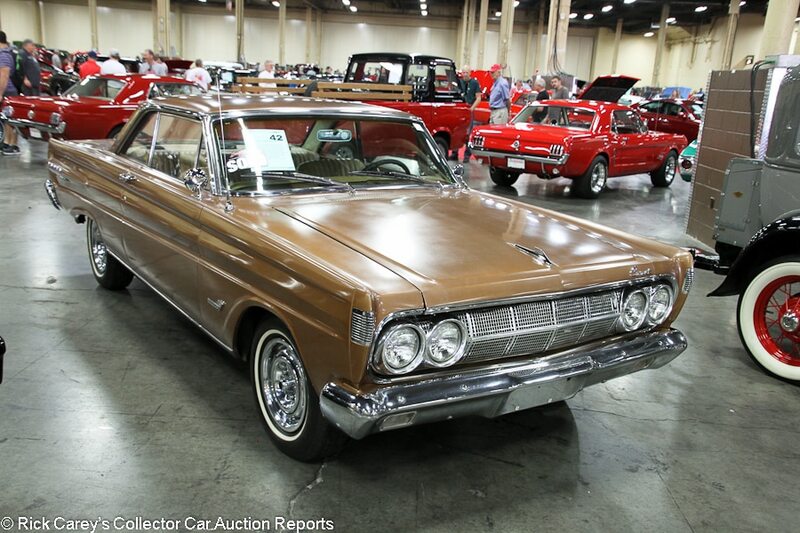 Lot # 42 1964 Mercury Comet Cyclone 2-Dr. Hardtop; S/N 4J27K515478; Ginger/Palomino Tan vinyl; Visually maintained, largely original, 3+ condition; No Reserve; Hammered Sold at $18,000 plus commission of 10.00%; Final Price $19,800. – 289/271hp K-code engine, automatic, wheel covers, narrow whitewalls, dual mirrors, bucket seats, console, column shift, added air conditioning, later cassette stereo with Pioneer speakers in the back. – All original other than the upholstery and air conditioning. Sound underneath. The paint is faded from the sun and has a fair number of blisters, chips and scratches, but it has that charming patina look to it. Lightly scratched chrome and brightwork, but again not bad. Lightly worn seats, especially in the back. A sound cosmetically restored car with the interior replaced ten years ago that makes for yet another perfect example that the climate out West is good for old cars. – The bright, dry, sunny environment that preserved the metal also sucked the life out of the upholstery, which is a reasonable trade-off. The K-code engine is an option even on the Cyclone making this one rather unusual. The standard engine was the D-code 210hp 2-barrel 289. A rare Mercury in this configuration that was not recognized for what it is with this result that would have been appropriate for the standard engine but fails to value the K-code at all. It is a very good deal. 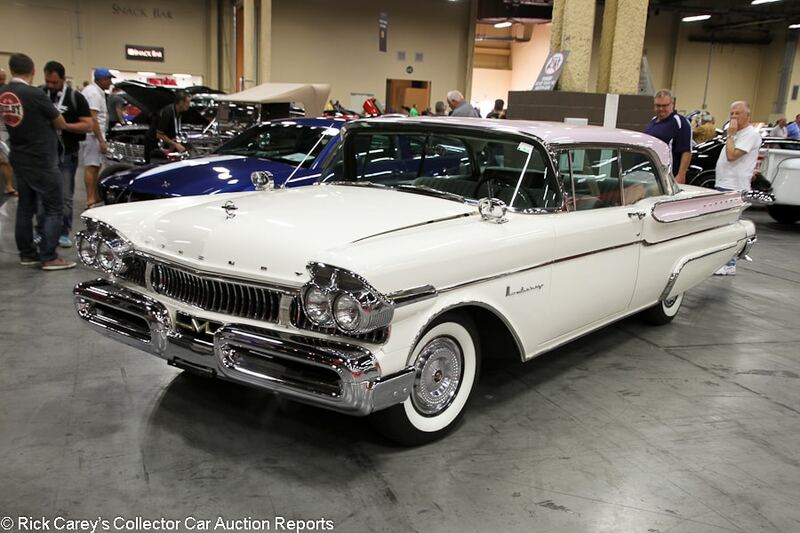 Lot # 340.1 1957 Mercury Monterey 2-Dr. Hardtop; S/N 57LA20728M; White, Sunset Orchid roof and accent/Gray cloth; Older restoration, 2- condition; No Reserve; Hammered Sold at $29,000 plus commission of 10.00%; Final Price $31,900. – 312/255hp, automatic, wheel covers, whitewalls, cruiser skirts, dual mirrors, Continental kit, column shift, pushbutton radio, dash clock, power steering, power brakes, tinted glass. – Represented as the matching numbers engine and a late production car with quad headlights like the ’58s. Two small touch ups on the nose, otherwise good older paint and brightwork, although the trim around the vent windows is lightly pitted and the vent windows themselves are delaminating. The interior is very good and the dash clock even works. Restored underneath. Lots of eyeball in these colors even if it isn’t perfect. – While the base 312/245hp engine makes this is a generous result there is no denying the appeal of the car in its drop dead gorgeous Fifties colors. The bidders can be understood, and even forgiven, for spending what would be in pretty much any other color combination too much for this Monterey. 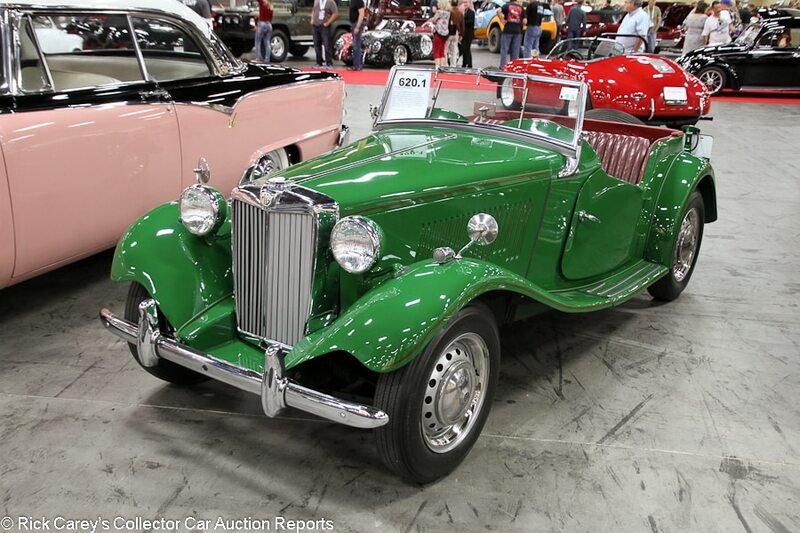 Lot # 620.1 1953 MG TD Roadster; S/N XPAGT0226309; Green/Burgundy; Enthusiast restoration, 3+ condition; No Reserve; Hammered Sold at $20,000 plus commission of 10.00%; Final Price $22,000. – Hub caps and trim rings, bias ply tires, dual wing mirrors, rear-mounted spare, banjo steering wheel. – The chrome and brightwork all appear original, showing plenty of fade and light scratches. The paint is sound but no better than an average quality respray. The interior has been restored and presents very well, although the driver’s seat shows significant wrinkling. Tidy undercoated frame. A driver quality restoration, which is pretty much the norm for these TDs, the somewhat underappreciated middle child in the T-Series family. Titled on the engine number. – A fair, somewhat strong price for a TD in this condition. 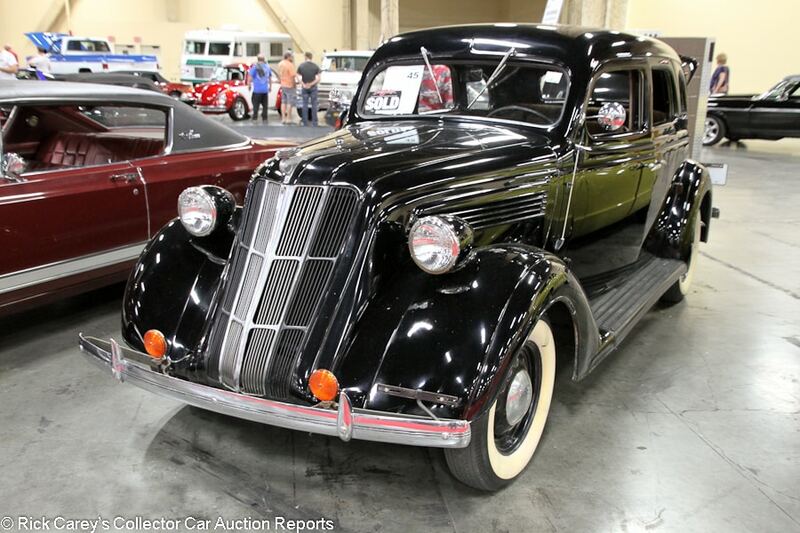 Lot # 45 1936 Nash 400 4-Dr. Sedan; S/N C6264; Black/Brown; Original, modified for competition or performance, 4+ condition; No Reserve; Hammered Sold at $11,500 plus commission of 10.00%; Final Price $12,650. – Ford 6-cylinder engine, 4-speed transmission, hub caps, whitewalls, suicide rear doors, dual mirrors, bench seat, floor shift, aftermarket underdash gauges. – Recently resurfaced out of 30 years in storage. Replacement engine. Rough old paint with chips and scratches all over as well as rub through in spots. Dry, discolored tires. Rough brightwork. Very good interior. There is surface rust on some of the suspension components but the underbody is mostly sound. You hardly ever see a prewar Nash in any condition, so even a rough one like this is attention-grabbing. – Unusual, to be sure, but to the Barrett-Jackson crowd this is probably seen as raw material for an even more eye-catching street rod. That is at least one way to interpret this price. 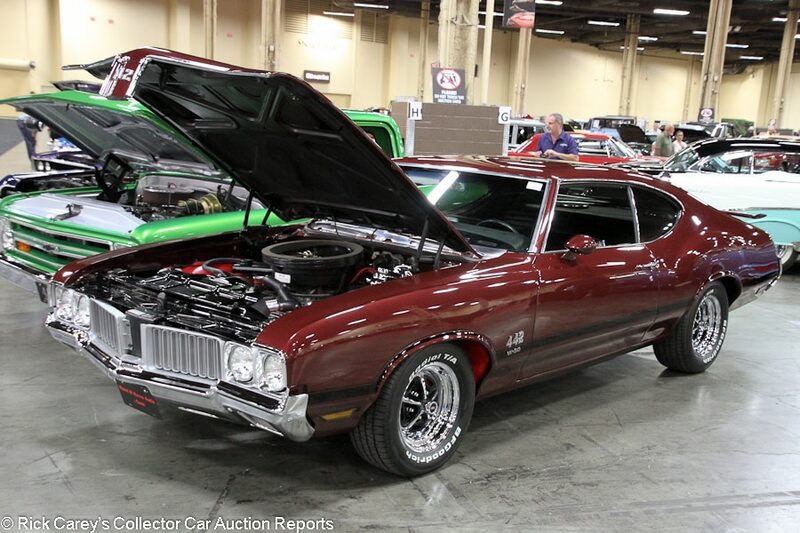 Lot # 330 1970 Oldsmobile 4-4-2 2-Dr. Hardtop Holiday; S/N 344870Z115943; Burgundy Mist/Black vinyl; Modified restoration, 2 condition; No Reserve; Hammered Sold at $50,000 plus commission of 10.00%; Final Price $55,000. – 455/370hp, automatic, Rally wheels, Radial T/A tires, modern aluminum radiator, chromed brake booster and brake cylinders, bench seat, column shift, pushbutton radio with Kenwood speakers in the back, Wilwood front discs, tinted rear glass. – Represented as a body-off restoration with a powder-coated frame. Not represented as matching numbers, claimed to be a W-30, modified and offered without documentation. Nearly spotless restored engine bay and underbody. Very good paint, chrome and interior that has all been redone. Original window frames are lightly scratched up and don’t fit perfectly evenly. A very attractive, well equipped and slightly customized car that was done recently enough as not to need anything. – This is fair money for an otherwise very good 4-4-2 hardtop that apparently has a replacement engine, a set of Wilwood front brakes, aluminum radiator and some engine compartment dressup. 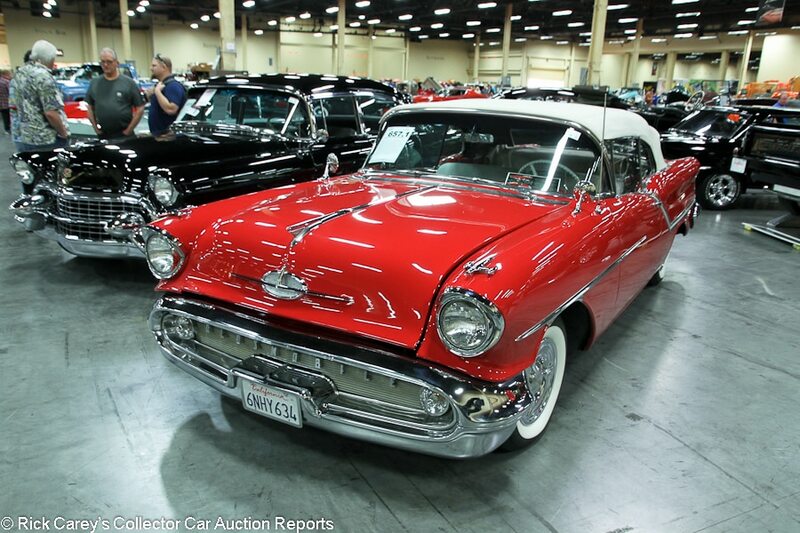 Lot # 657.1 1957 Oldsmobile Golden Rocket 88 J-2 Convertible; S/N 577M45530; Festival Red/Red, White vinyl; White vinyl top; Older restoration, 2- condition; No Reserve; Hammered Sold at $42,000 plus commission of 10.00%; Final Price $46,200. – 371/300hp J-2 Tri-Power, automatic, wheel covers, whitewalls, dual mirrors, pushbutton radio, power steering, power brakes, dash clock. – Very good paint and chrome. The doors stick out slightly at the bottom. There is some light discoloration on the top. Very good interior other than some light pitting on the unpainted parts of the dash. Tidy underneath. A straightforward older full restoration with little to pick on, but enough to keep it from being a show car. No documentation offered for the J-2 Tri-Power’s originality – Sold by Mecum at Monterey in 2010 for $73,670 when it was a fresh restoration, then crossed the block at Russo and Steele in Scottsdale two years ago where it was bid to $50,000. The restoration’s age is beginning to show, as are some post-restoration miles, but even with that this is a highly desirable Olds convertible for a very advantageous price that should have brought over $50,000 on the hammer. 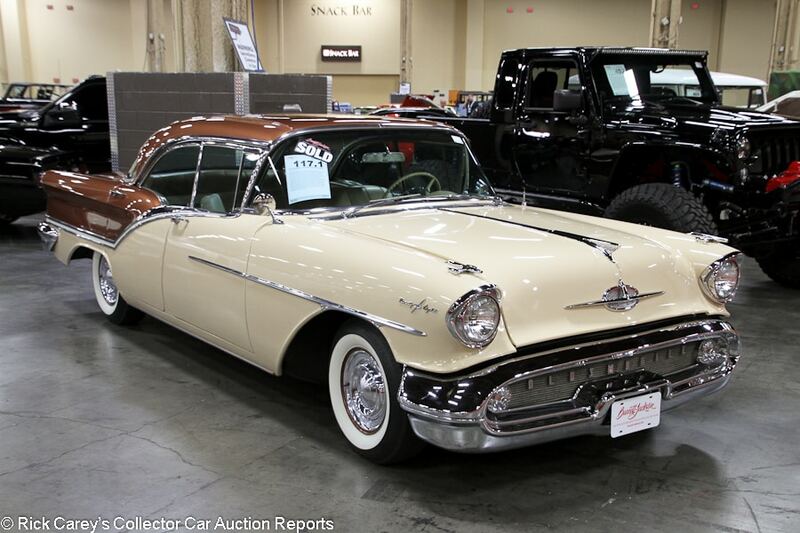 Lot # 117.1 1957 Oldsmobile Starfire 98 4-Dr. Hardtop Sedan Holiday; S/N 579C07738; Chantung Beige, Cutlass Bronze/Beige vinyl, Fawn cloth; Older restoration, 2- condition; No Reserve; Hammered Sold at $30,000 plus commission of 10.00%; Final Price $33,000. – 371/300hp, automatic, wheel covers, whitewalls, power steering, power brakes, dash clock, WonderBar radio, dual mirrors. – Very good blemish-free older paint and chrome. The panel fit is erratic all around. Very good interior with newer upholstery and headliner. The dash is original and very well kept, while the steering wheel has a few cracks. A California black plate car, mostly restored in 2003 and done to a pretty high standard but now gaining some patina. 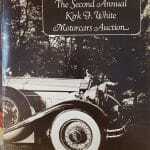 – This is an ample price for a 4-door Holiday even one as sound and well-restored as this. 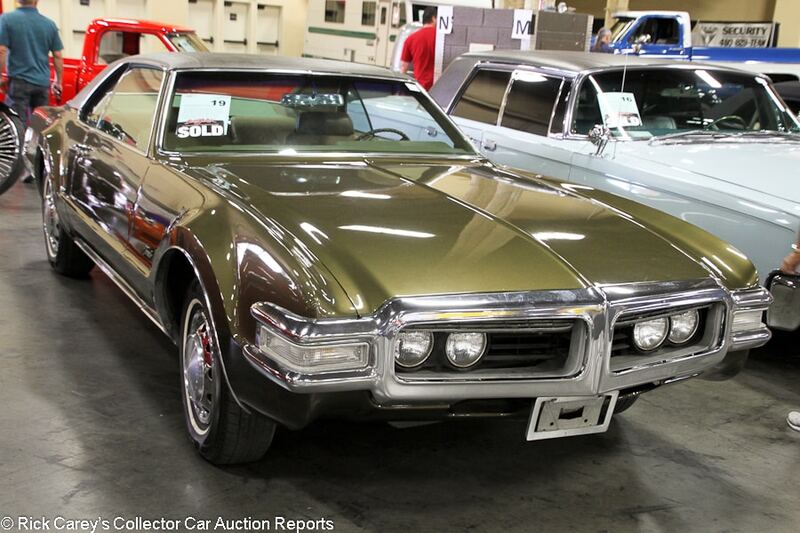 Lot # 19 1969 Oldsmobile Toronado Coupe; S/N 394879M613270; Green, Green vinyl roof/Brown cloth; Visually maintained, largely original, 3+ condition; No Reserve; Hammered Sold at $10,500 plus commission of 10.00%; Final Price $11,550. – 455/375hp, automatic, wheel covers, narrow whitewalls, bench seat, column shift, pushbutton AM-FM radio, dash clock, rear seat speaker. – Represented with new paint, shocks, battery and tires as well as a recent tune up. The chrome and brightwork is original but quite good considering the age and 92,612 miles which are represented to be original. The door fit is erratic. The interior is very good other than some sun fading underneath the rear glass. Tidy but original and lightly worn underneath. Definitely good enough to enjoy and cruise in but no show car. – Unfortunately, the stigma of front-wheel drives continues to dog the Toronado even though most people will never drive one hard enough to tell which wheels are putting power to the ground. These cars are brilliantly engineered, fast, attractive and comfortable, so they’re a decent bargain in terms of classic ’60s luxury. This example is far from the world’s best, but it’s a good enough driver and it deserved closer to 20 grand, making this a pretty sweet deal for the new owner. 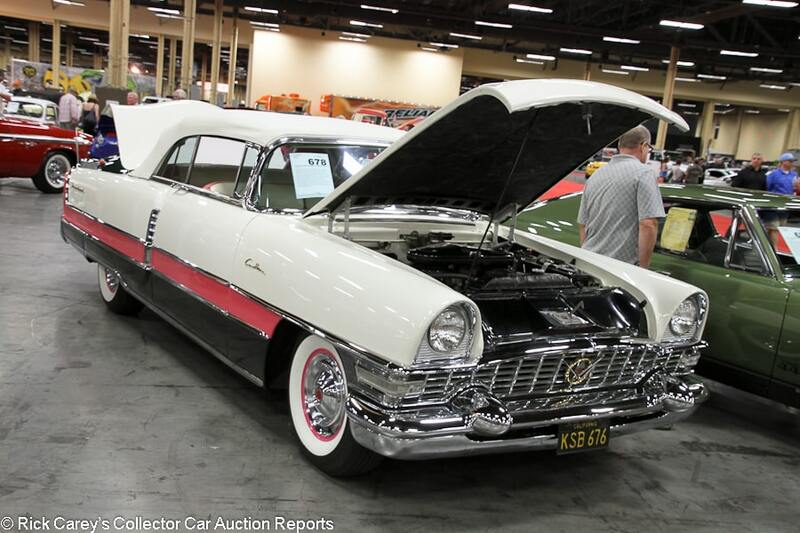 Lot # 678 1955 Packard Caribbean Convertible; S/N 55881244; White, Jade, Rose Quartz/Jade, White, Rose Quartz; White leather top; Visually maintained, largely original, 3+ condition; No Reserve; Hammered Sold at $52,000 plus commission of 10.00%; Final Price $57,200. – 352/275hp dual quads, automatic, wheel covers, whitewalls, dual quads, fender skirts, dual antenna, power windows, power top, dash clock, pushbutton radio, power seat, power steering, power brakes. – Represented as matching numbers. Very clean and maintained but not fully restored engine bay. Very good paint, bumper chrome and top. The body side trim is a bit scratched and here are two small dents at the right rear. The Packard badge on the tail is also severely cracking. Lightly wrinkled seats but mostly very good interior. An attractive and presentable example, but far from show quality. – By any standard, even if it didn’t run on the auction block, this is a very good value in a rare and distinctive tri-tone painted flashy Caribbean. 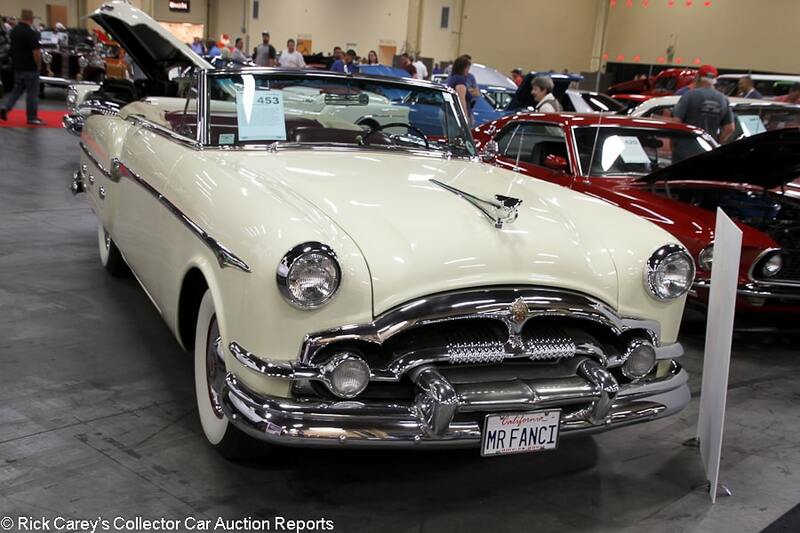 Lot # 453 1953 Packard Mayfair Convertible; S/N 26792395; Sahara Sand/Maroon leather; Older restoration, 3+ condition; No Reserve; Hammered Sold at $50,000 plus commission of 10.00%; Final Price $55,000. – Automatic, wheel covers, wide whitewalls, Cormorant mascot, fender skirts, boot cover, power steering, power brakes, power top, factory pushbutton radio. – Sound older paint and brightwork. Discoloration on the whitewalls. Uneven panel fit. The rear bumper was left alone and is both dull and pitted. Cracking steering wheel cap. The interior is otherwise good and lightly worn. Restored, but done years ago and lightly used since, which takes little away from the elegance that these postwar Packards naturally possess. – Sold at Russo and Steele Monterey this year for $55,000. Despite the bigger crowd of bidders in Las Vegas it brought the exact same amount, which corroborates both results as realistic numbers. 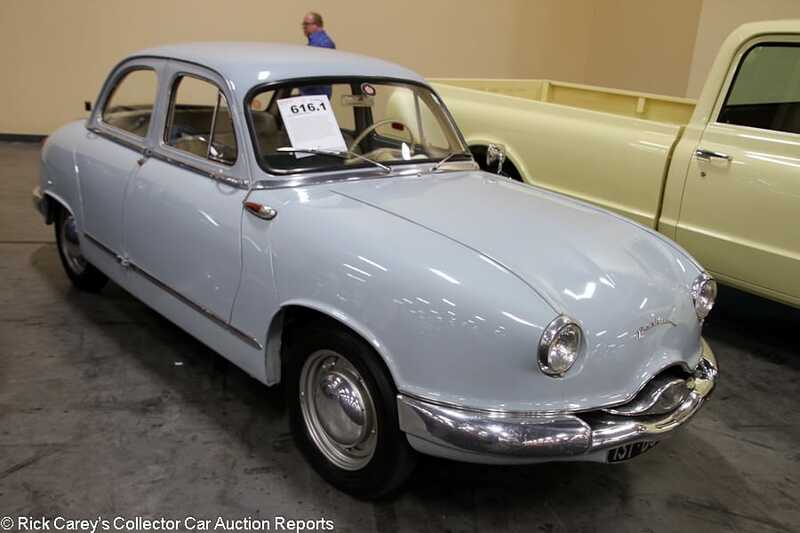 Lot # 616.1 1957 Panhard Dyna Z 4-Dr. Sedan; S/N 1038497; Light Blue/White vinyl, Blue cloth; Unrestored original, 4+ condition; No Reserve; Hammered Sold at $12,700 plus commission of 10.00%; Final Price $13,970. – Hub caps, Michelin tires, column shift manual, suicide front doors. – Represented as 38,745 kilometers from new. The paint looks original and has several scratches and chips all over but is still shiny and sound. The engine bay is grimy. The seats are discolored and the upholstery is loose. The dash trim is cracking a bit. The frame is a bit grimy but free of rust. The bumpers are scratched up. A charming little car that was a clever design in its day. You don’t see them often on this side of the Atlantic, and it got a lot of people’s attention during the sale. Even so, it’s totally original and there’s no telling what kind of work and hard to find parts it needs. – Putting a value on old Panhards is far from an exact science, but the Vegas bidders forgave this car’s aged appearance and went for the cute factor and originality. This seems like strong money for a 50hp Panhard, but they are known for surprising performance. The 2-cylinder engine is true to Panhard et Levassor’s roots in the nineteenth century. Lot # 445 2005 Panoz Esperante Convertible; S/N 1P9PB67385B213016; Black/Beige leather; Unrestored original, 2- condition; No Reserve; Hammered Sold at $55,000 plus commission of 10.00%; Final Price $60,500. – Alloy wheels, Eagle F1 tires, boot cover, supercharger, automatic, GTLM body panels, carbon fiber interior trim, power windows, air conditioning. – Represented with less than 6,000 miles. There are a few chips and cracks on the low nose, but otherwise this presents like a new car. The combination of supercharged engine and 4-speed automatic are odd, but may hint at collecting those 6,000 miles at drag strips. – It’s worth whatever the B-J Las Vegas bidders thought it was although one might think about what else this much money would buy. 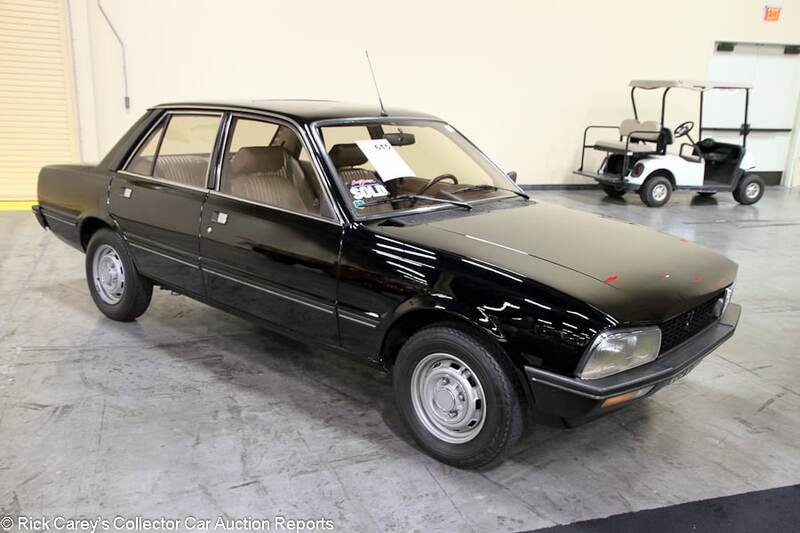 Lot # 615 1980 Peugeot 505 Sti 4-Dr. Sedan; S/N 551A141102220; Black/Tan; Unrestored original, 2 condition; No Reserve; Hammered Sold at $7,700 plus commission of 10.00%; Final Price $8,470. – 1995/110hp, automatic, Michelin tires, sunroof, cassette stereo, power windows, dash clock, Euro headlights. – Several sizable chips on the hood, but otherwise very good original paint. Straight body with even gaps. Very light wrinkling to the seats. The interior is immaculate otherwise. Showing 7,995 believable miles. This has to be one of the better Peugeots of any kind in this country. Perfect for the old eccentric type who wants a vintage luxury sedan but feels the equivalent BMW, Mercedes or Volvo is too mainstream. – This is definitely not mainstream but Peugeots of this period were more than competent rally cars. The on-site reporter referred to an ‘old eccentric type’, and the editor must admit that he likes it, especially at this price. 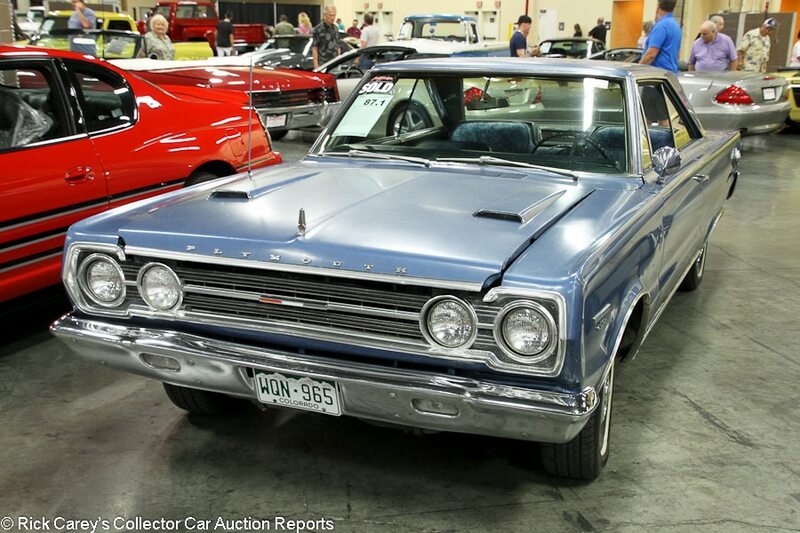 Lot # 87.1 1967 Plymouth Belvedere GTX 2-Dr. Hardtop; S/N RS23L77185560; Monotone Bright Blue Metallic/Blue cloth; Unrestored original, 3- condition; No Reserve; Hammered Sold at $23,000 plus commission of 10.00%; Final Price $25,300. – 440/375hp Super Commando engine, automatic, wheel covers, Uniroyal narrow whitewalls, bucket seats, console, floor shift, pushbutton radio, rear seat speaker, Sure Grip. – All original other than new tires, but represented as ready to drive. The engine bay is unrestored but tidy. The paint is very faded and lightly scratched up but sound enough to keep as is if you’re into this look. Tidy underbody. Worn but presentable upholstery. Cracks on the dash top. There is a long crack in the windshield, so that will at least need to be replaced. A well-equipped barn find-type GTX but without representation that the Super Commando 440 is the original engine, only that provided by the VIN which says this is how it left the St. Louis assembly plant. More than good enough to enjoy as-is after a thorough recommissioning for reliability and safety, but would also make a sound restoration candidate. – This result is discounted for the aged condition, with no allowance for its originality and one family history, making it an astute acquisition at this price for someone who appreciates its originality and preservation. This result is more appropriate for a ratty barn find that has no future except as the basis for a comprehensive restoration. 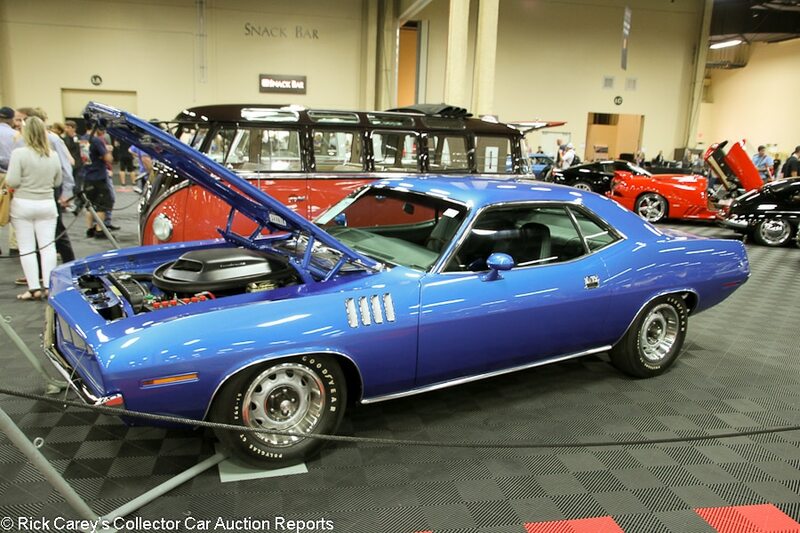 Lot # 751 1971 Plymouth ‘Cuda Hemi 2-Dr. Hardtop; S/N BS23R1B288866; True Blue/Black; Older restoration, 2 condition; No Reserve; Hammered Sold at $360,000 plus commission of 10.00%; Final Price $396,000. – 426/425 Hemi, dual quads, 4-speed, hood pins, Polyglas GT tires, shaker hood, Super Track Pack, AM radio. – Fully restored but not overly detailed engine bay. Excellent paint, chrome and interior. Fresh and fully redone genuine Hemi Cuda with no stories, represented to be the matching numbers engine. The restoration was completed 12 years ago and still looks fresh today. – This ‘Cuda has been around a while and its auction history is emblematic of the Hemi ‘Cuda’s ups and downs. In 2006 Russo and Steele reported it sold for a fully magnanimous $715,000 at Scottsdale. Nineteen months later it was a their Monterey auction in 2008 where it no-saled at $300,000, then sold five months later at their Scottsdale sale in 2009 for $341,000. It’s gained a little back since then, as Hemis have, but isn’t going far fast, at least in value. Lot # 170 1970 Plymouth Road Runner 2-Dr. Hardtop; S/N RM23N0A244054; Tor-Red, Black stripe/Black, Silver vinyl; Enthusiast restoration, 2- condition; No Reserve; Hammered Sold at $30,000 plus commission of 10.00%; Final Price $33,000. – 383/335hp, automatic, Cooper Cobra tires, bench seat, column shift, pushbutton radio. – Very good interior that is lightly aged and original aside from the carpets and trunk floor. Reportedly raced with a different engine before being restored with the original drivetrain put in place. Restored but not overly detailed engine bay. Very good paint and chrome. Factory gaps. Restored underneath. A basic but attractive restoration done to enthusiast standards. – Road Runner was a stripped ‘plain pipe racks’ de-contented car for the money-challenged youth market that valued performance over the more luxurious appointments and standard features of the GTX. This is a good example with the 4-barrel 383, 727 automatic and bupkus in the way of amenities. It could have brought a little more, but is not unreasonably inexpensive at this buyer-satisfying result. 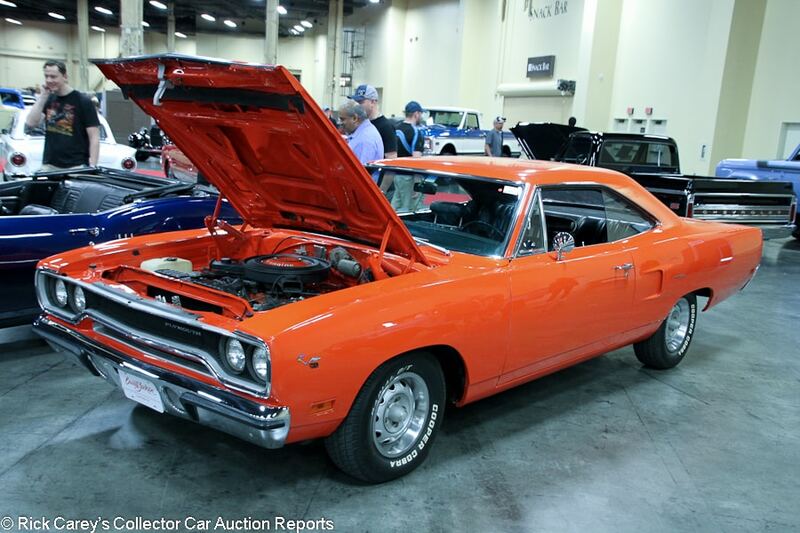 Lot # 470 1970 Plymouth Road Runner 2-Dr. Hardtop; S/N RM21N0E140614; Deep Burnt Orange Metallic, Black/Burnt Orange; Recent restoration, 2+ condition; No Reserve; Hammered Sold at $60,000 plus commission of 10.00%; Final Price $66,000. – 383/335hp, 4-speed, hub caps, Firestone red line tires, 3.23 gears, Hurst pistol grip shifter, AM radio, bench seat, Sure Grip. – Represented as all matching numbers. Very good paint, chrome and interior. Factory gaps. There is a small blister in the paint next to the rear window, but that is the only apparent flaw in this freshly and fully restored 383 Road Runner. – This is show car money, and this is a carefully restored and presented show car restoration, fresh out of the shop. 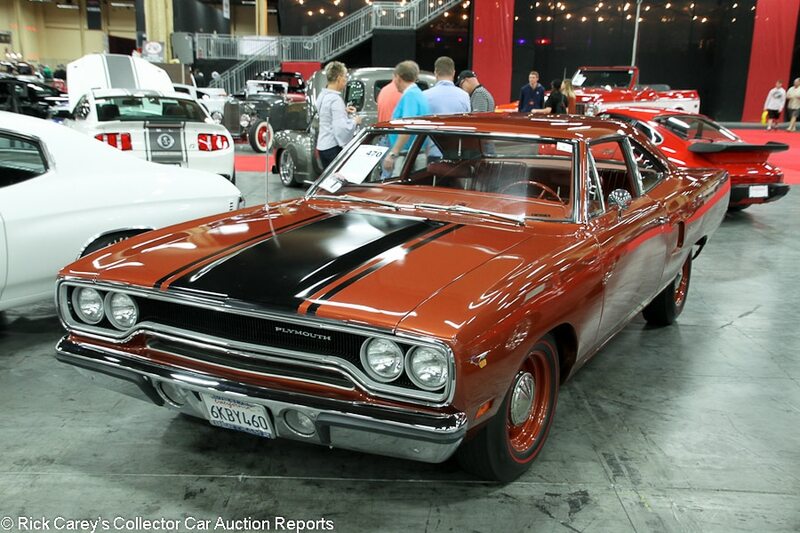 Its appeal to the B-J Las Vegas bidders is apparent from the superior price it brought, exactly double the automatic ’70 Road Runner in entirely satisfactory but not so thorough or meticulous condition sold yesterday. 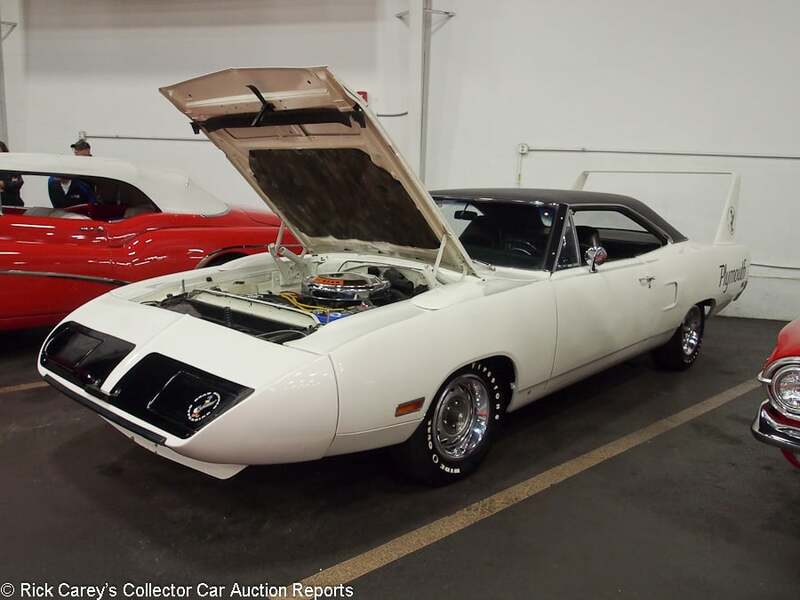 Lot # 766 1970 Plymouth Road Runner Superbird 2-Dr. Hardtop; S/N RM23V0A172636; White, Black vinyl roof/Black vinyl; Modified restoration, 3 condition; No Reserve; Hammered Sold at $120,000 plus commission of 10.00%; Final Price $132,000. – 440/390hp Six Barrel now with a 426/425hp Hemi, automatic converted to a 4-speed, Hurst pistol grip shifter, underdash engine gauges, power brakes, Rally wheels, trim rings, Wide Oval tires, pushbutton radio. – Sound older paint applied to a partially assembled body with several masking holidays. Prep flaws and fisheyes here and there, chips on the painted hood hinges. Crazing black paint on the nose. Sound, aged interior. Aged engine compartment. 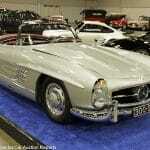 – This car was a no-sale on a bid of $100,000 at Auburn Fall six weeks ago. Replacing the 440 Six Barrel with a Hemi was a bad idea to begin with, then it was crudely done and not very well maintained. That the consignor found someone gullible enough to bid 20% more in Las Vegas is something of a miracle and gratitude and thanks should be showered on the B-J team for working this miracle. This is a lot to pay for a mediocre Superbird. 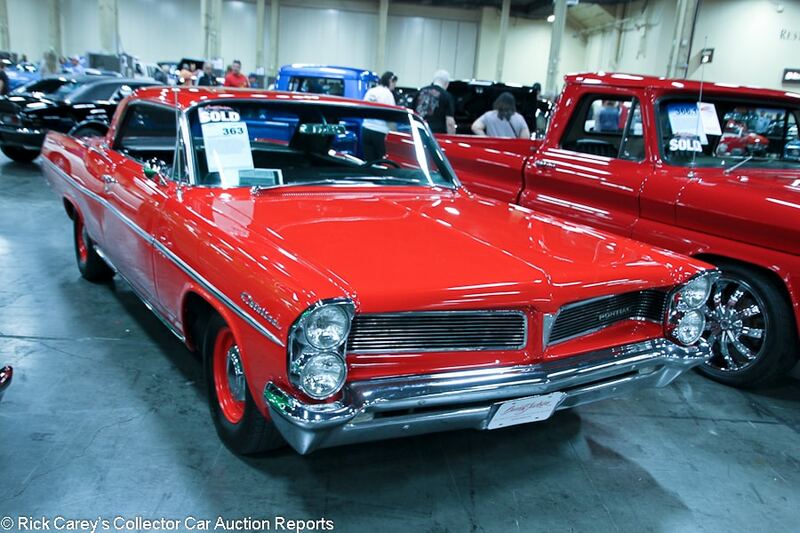 Lot # 363 1963 Pontiac Catalina 2-Dr. Hardtop; S/N 363K24718; Red/Black vinyl; Modified restoration, 2- condition; No Reserve; Hammered Sold at $25,500 plus commission of 10.00%; Final Price $28,050. – 389/267hp upgraded with a 4-barrel and converted to a 4-speed, hub caps, Radial T/A tires, bucket seats, floor shift, Super Deluxe radio, power steering, Protect-O-Plate. – Represented as matching numbers with an upgraded four-barrel carb, but otherwise the description on the car card is pretty vague. The paint looks fairly recent, and is very good aside from a long touched up scratch on the nose. The chrome is older and has light scratches. The interior appears original and is very good apart from light general wear on the switchgear and slightly loose headliner. Undercoated chassis. The rear window gasket is dry and cracking. A car that got some restoration work on the parts that needed it the most, but left much of it original and rather tired. – It may be numbers-matching, but it’s not as it was built and that makes this a generous price. 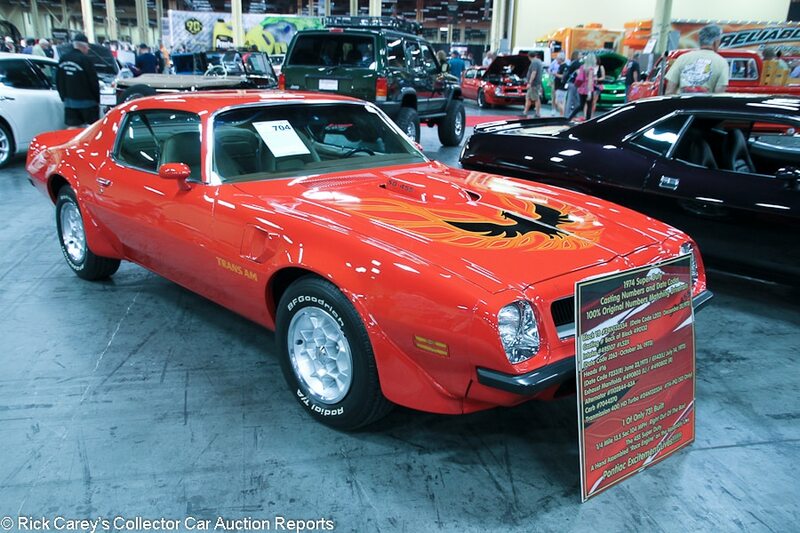 Lot # 704 1974 Pontiac Firebird Coupe; S/N 2V87X4N132334; Red, Trans Am graphics/Saddle vinyl; Visually maintained, largely original, 2- condition; No Reserve; Hammered Sold at $69,000 plus commission of 10.00%; Final Price $75,900. – 455/290hp Super Duty engine, automatic, snowflake wheels, Radial T/A tires, console, power windows, factory radio, air conditioning, PHS documents, original build sheet. – Represented as a matching numbers Super Duty with a repaint but the original decal graphics in place. Showing 38,416 miles. There is a sizable scuff on the top of the nose as well as some light scratches on the hood and screaming chicken decal. The original interior is fantastic with no serious wear. There are some serious cracks in all four of the wheels, though. The underbody is very clean. A genuine and pretty rare SD 455 that is attractive from a distance, but up close is inconsistently presented and would benefit from more thorough restoration work. – Sold for $132,000 at Barrett-Jackson Scottsdale in 2014, then for $107,800 at Barrett-Jackson Scottsdale last year. The bidders in Vegas apparently had a much closer look at this car and bid it to a more realistic price, although it probably could have brought another 10 percent or so without being expensive. This is a nearly precipitous drop in value in just three years. 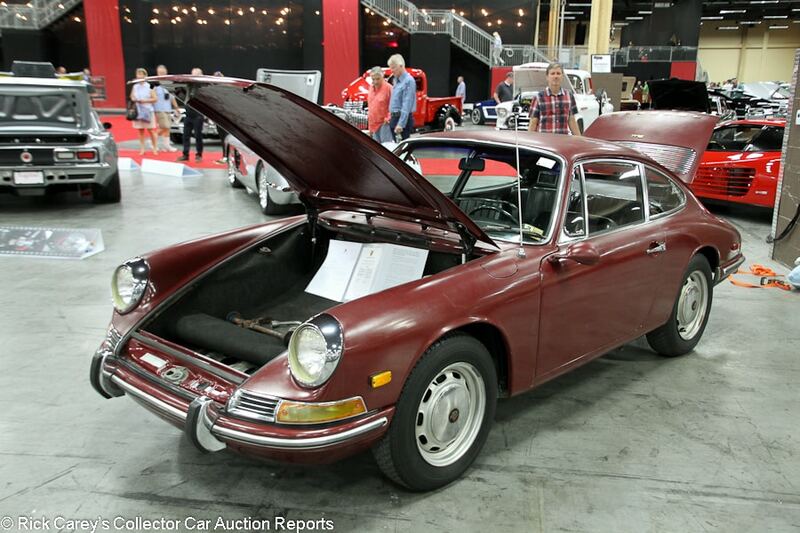 Lot # 692.1 1968 Porsche 911 Coupe; S/N 11835381; Burgundy/Black; Unrestored original, 3- condition; No Reserve; Hammered Sold at $50,000 plus commission of 10.00%; Final Price $55,000. – 1991/148hp, 5-speed gearbox, hub caps, Michelin XZX tires, gold brightwork, Sanyo cassette stereo. – Left in an airplane hangar for many years and all original other than a 1986 repaint over the original Irish Green. The driver’s mirror is incorrect, and the passenger’s side mirror is missing. The paint is dull enough to present as original. There is some pitting on the wheels. The engine bay is old but remarkably tidy and it’s complete. Well preserved interior. The engine is reported to run, but that’s it. People into patina will like this car. It has just the right amount of age but isn’t grimy or falling apart, although it will need plenty of attention before being driven. – There was no originality or barn find premium for this Porsche. The Vegas bidders saw it as nothing more than an early 911 that needs a lot, and showed it with their bids. 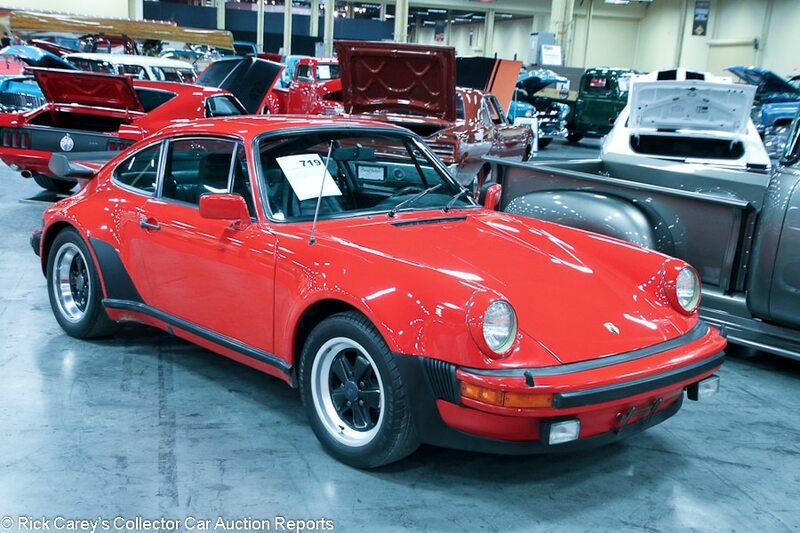 Lot # 719 1979 Porsche 911 Turbo 930 Coupe; S/N 9309800529; Guard Red/Black leather; Unrestored original, 3- condition; No Reserve; Hammered Sold at $66,000 plus commission of 10.00%; Final Price $72,600. – 3.3/265hp, 4-speed, black Fuchs wheels, Toyo tires on the rear, store brand tires on the front, cross-drilled rotors, power windows, air conditioning, Kenwood cassette stereo, sunroof. – Showing nearly 95,483 miles and very much presents like a used car. The exterior plastic is dull, faded and even wavy in spots. There is newer glossy black paint on the rear wheels and matte black paint on the front, which is also coming off in spots. The body was repainted a while ago, but it is old enough to be faded and there are masking errors on the tail. The seats and carpets show wear that corresponds with the mileage and there are staples in the dash above the air vents. A driver quality 930, and not a good one, plus the seller here is a couple of years late in capitalizing on the frenzy for these cars. – This is a realistic price for a shady car with lots of problems and no history or CoA. A performance car with a mix of tire brands on the front and rear is a sure sign of negligent care and attention. The bidders read the signs and even at this price the seller should be glad to be relieved of it, having never cared about keeping it up. 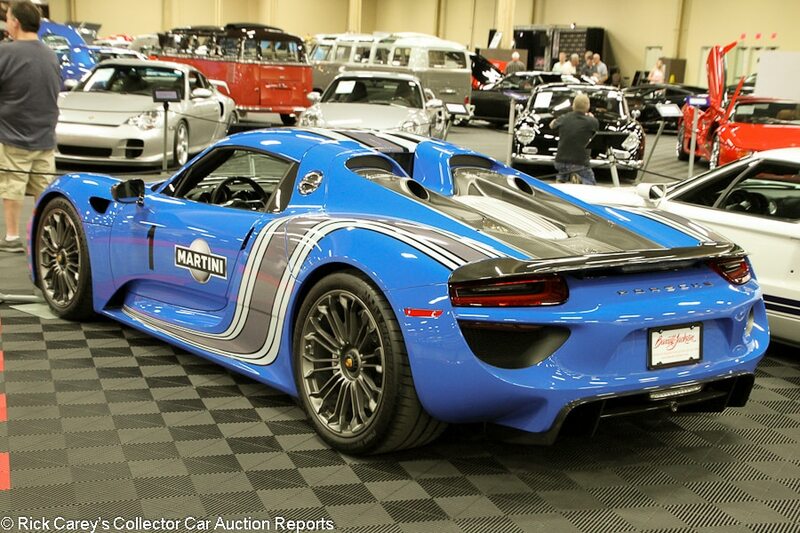 Lot # 750 2015 Porsche 918 Spyder Targa; S/N WP0CA2A1XFS800184; Voodoo Blue, Martini graphics/Black; Unrestored original, 2 condition; With Reserve; Hammered Sold at $1,600,000 plus commission of 10.00%; Final Price $1,760,000. – Martini graphics, removable roof. – No wear or blemishes. Represented with 1,300 miles. Supposedly the only one finished in this color of Voodoo Blue. Presents like a new car, as most all of these still do. – While the 918 had an MSRP of less than a million dollars, once these cars started hitting the collector car market the going rate settled between $1.5M and $2M. It’s worth a bit less than its rival the McLaren P1 and significantly less than the LaFerrari, but it’s also the most common of the three hybrid hypercars. Lot # 309 1990 Porsche 944 S2 Cabriolet; S/N WP0CB2945LN481492; Guards Red/Black; Black cloth top; Unrestored original, 3- condition; No Reserve; Hammered Sold at $14,000 plus commission of 10.00%; Final Price $15,400. – Alloy wheels, Hankook tires, power windows, air conditioning, CD stereo. – Showing 116,015 miles, and not babied like your typical Porsche. There is a long crack in the windshield. Slightly dulled paint with lots of chips and scratches on the nose and hood. Reasonably tidy underneath. Other than a popped seam in the passenger’s seat and light wear to the upholstery, the interior is actually quite good. Represented with new top, tires and axle boots. The engine bay was recently detailed. Also represented as having the timing belt replaced 20,000 miles ago, but there is no word about the water pump. Timing belt and water pump are the two major regular service items on a 944, and the jobs should really be done together. 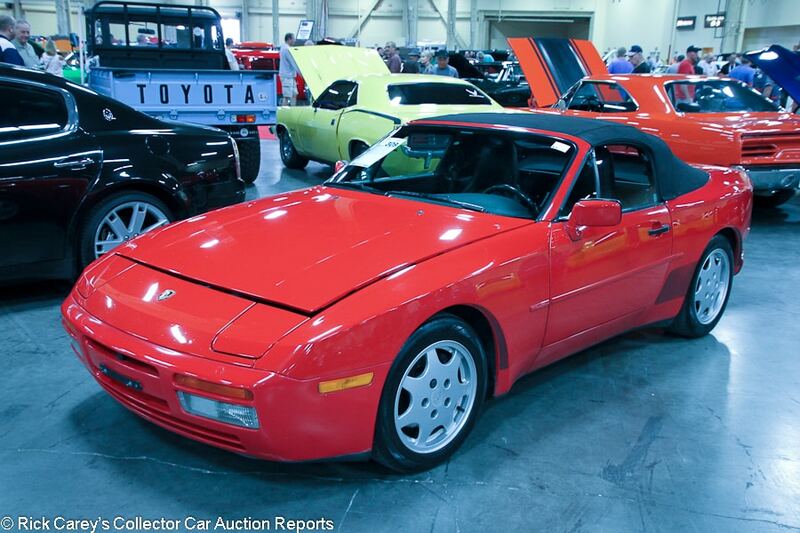 These S2 cabs are relatively rare but like all 944s have never been particularly expensive. This car has wear corresponding with its very high mileage, and it has needs. – This is big money for a driver quality 944, especially when you consider that a faster, newer Boxster with far fewer miles is similar money. 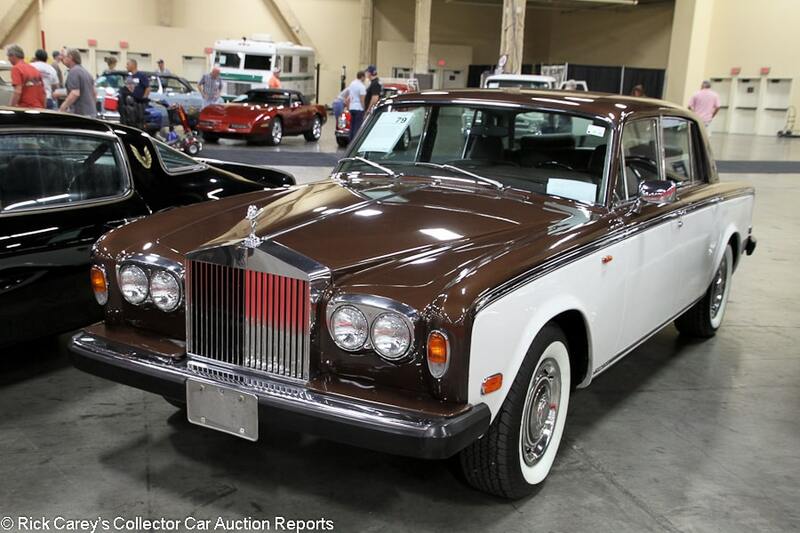 Lot # 79 1979 Rolls-Royce Silver Shadow II 4-Dr. Sedan; S/N SRK39010; Walnut Brown, Porcelain White sides/Black Leather, Grey piping; Unrestored original, 3 condition; No Reserve; Hammered Sold at $23,000 plus commission of 10.00%; Final Price $25,300. – Wheel covers, whitewalls, factory air conditioning, wood dash and door trim, opera mirrors, Pioneer cassette stereo, dash clock, power seats. – Showing 42,019 miles. No service history or history of any kind represented, other than that it has always been garaged. The chrome and brightwork is all lightly scratched. Some crazing and chips on the hood but the rest of the paint is sound. The interior wood is sound but could stand to be refinished. The window frames are pitted and the weather stripping is cracked. The cover is missing off the driver’s side window switch. The seats are good but lightly worn. Sound underneath with no rust. Good enough to enjoy as-is, provided it checks out mechanically. – It’s usually hard to bid with confidence on one of these cars if there are questions about its service history. Not so for at least two bidders at this auction, though, who attached too much to the words ‘Rolls-Royce’ and bid this car to nearly the top of the value range for one of these cars even though it deserved an amount somewhere in the middle. A strange color combination. 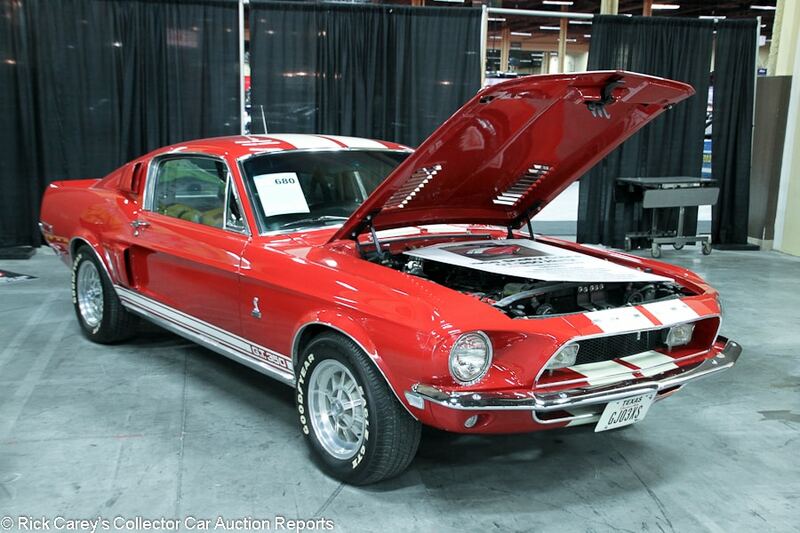 Lot # 680 1968 Shelby Mustang GT350 Fastback; S/N 8T02J149345-01144; Candy Apple Red, White stripes/Black vinyl; Older restoration, 2- condition; No Reserve; Hammered Sold at $100,000 plus commission of 10.00%; Final Price $110,000. – 302/250hp, Shelby wheels, Goodyear Eagle GTII tires, console, Philco radio, originally an automatic but now has a 4-speed, Marti report. – Reportedly sold new to Hertz but not designated as a GT350H, equipped with the standard 302/250hp J-code engine. Good, lightly run restored engine bay. Light scratches on the door handles. Otherwise very good older paint and chrome. Like new fully restored interior. Fully restored 10 years ago and lightly used since. – Shelby started supplying GT350s to Hertz Rent a Car again in 1968, but on a much smaller scale. That this one never had any Hertz badging on it gives it an interesting story, but if you look at it another way, it’s just another ’68 GT350 that led the hard life of a rental car when it was new. Bidders place value on the Hertz story, though, since this car sold for at this sale in 2011 and at the Orange County sale four months before that both at the exact same $110,000. The odometer has added 648 miles since 2011. The money isn’t as strong for one of these as it was in 2011, but both results show a premium over a standard car in this condition. It has no performance credentials. An S-code Mustang is faster and less than half the price; it’s all about the Shelby mystique. 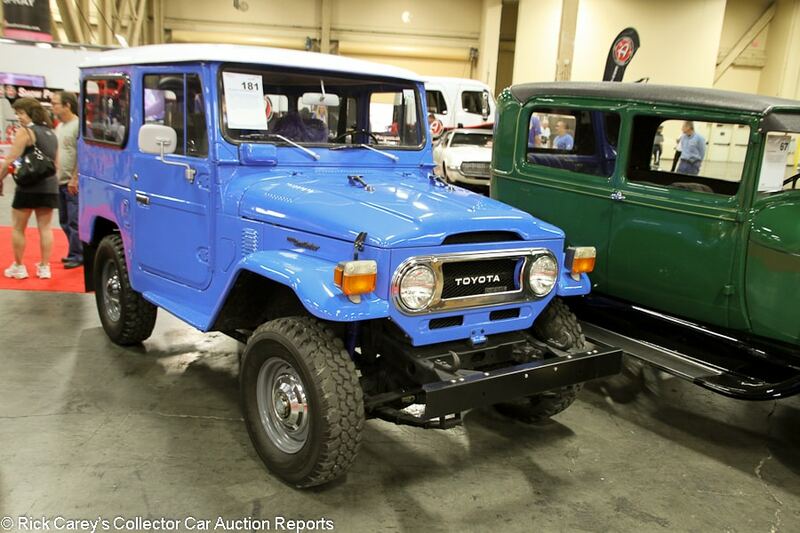 Lot # 181 1976 Toyota BJ-40 Land Cruiser Hardtop 4×4; S/N BJ40002258; Blue, White Roof/Gray cloth; Truck restoration, 3+ condition; No Reserve; Hammered Sold at $25,000 plus commission of 10.00%; Final Price $27,500. – Diesel BJ40 model with hub caps, dual mirrors, rear-mounted spare, Pioneer CD stereo. – Represented as a body-off restoration. Showing 31,470 km. Average quality respray that is a bit older and has light swirl scratches, particularly on the hood. Masking errors on the roof. Several scratches on the rear windows. Wavy body sides. Rusty screws on the hood hinges. Incorrect door locks. The underbody is very tidy. This BJ is definitely a driver, but it has had all its needs seemingly addressed and looks ready to hit the trail. – Sold at Barrett-Jackson Scottsdale last year for $30,800, at Auburn Spring for $23,100 and at B-J Scottsdale earlier this year for $27,500, the same price it brought here. The market is full of Central American Land Cruiser diesels with metric instruments resurrected from years of extreme duty and fluffed up to supply the Land Cruiser craze. Their survival is a tribute to the qualities of durability and capability that makes Land Cruisers beloved. Based on this one’s history at auction over the past nearly three years, this is what it’s worth, give or take a bid or three. 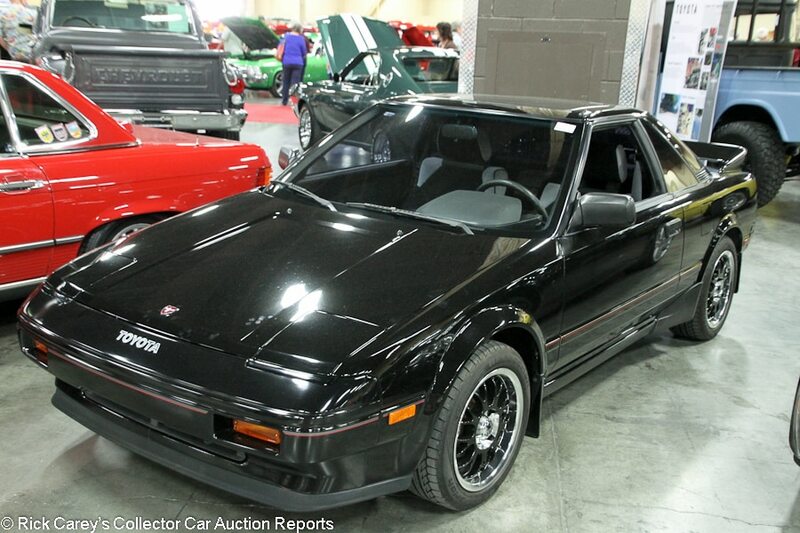 Lot # 316 1986 Toyota MR2 Coupe; S/N JT2AW15C8G0087189; Black/Black, Gray cloth; Unrestored original, 2 condition; No Reserve; Hammered Sold at $17,000 plus commission of 10.00%; Final Price $18,700. – Aftermarket wheels (originals included in the sale), rear spoiler, sunroof, cassette stereo, console. – Showing 1,547 miles that are represented as all it’s covered since new and seemingly stock other than the wheels. The paint doesn’t quite present like new but it’s close enough and shows no blemishes other than a scratch on the right headlight door. The Toyota script on the nose, though, is a sticker and it’s starting to come up. The interior presents like new. The mileage on the odometer seems hard to believe, but the condition backs it up. It’s hard to find an unmolested first gen MR2 in anything but ratty shape, which makes this car pretty special. – The Vegas bidders realized that the opportunity to buy a like-new first gen Mister Two hardly ever comes up and got enthusiastic with the bids. This is a landmark price for one of these cars that, even though it looks like a doorstop, is often hailed as a ‘poor man’s Ferrari’ but its originality and preservation are astounding. 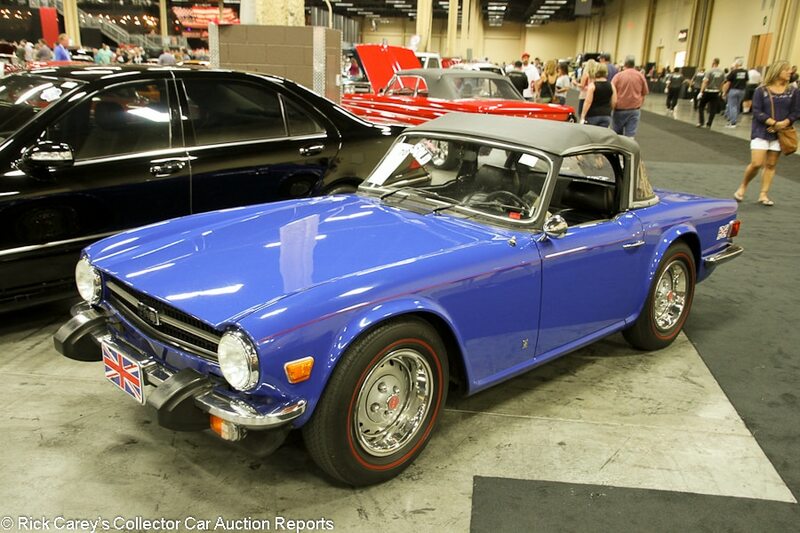 Lot # 70 1976 Triumph TR6 Convertible; S/N CF55585U; Delft Blue/Black; Black vinyl top; Enthusiast restoration, 3 condition; No Reserve; Hammered Sold at $20,000 plus commission of 10.00%; Final Price $22,000. – 2498/101hp, 4-speed, factory road wheels with trim rings, Michelin X red line tires, roll bar. – Good newer top. The repaint was never very high quality to begin with, and now shows several chips and scratches, particularly on the trunk lid. The trunk lid also has a small but noticeable dent at the bottom left edge. The black paint on the tail is glossy but it should be a matte finish. The parking brake handle and shift knob are also incorrect, and the parking brake boot is ripped. Some of the switchgear is faded, and while there used to be an aftermarket radio, it has since been removed and leaves only a big hole in the dash. Tidy underneath with no rust. An enthusiast restoration, and not a good one. – The gap in value between really good TR6s and rough or driver quality examples is pretty big. While this car is rust-free and presentable, it’s rough around the edges and did not deserve this price, which would ordinarily buy a better freshly restored car. This result is a home run for the seller. 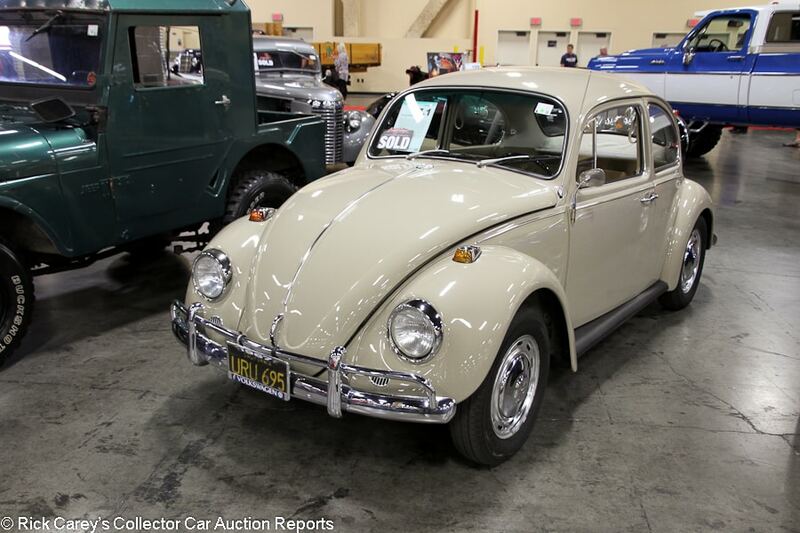 Lot # 7.1 1967 Volkswagen Beetle 2-Dr. Sedan; S/N 117428297; Tan/Tan vinyl; Modified restoration, 2- condition; No Reserve; Hammered Sold at $8,500 plus commission of 10.00%; Final Price $9,350. – Later 1600 dual port engine, highway transmission, 12-volt electrics, wheel covers, wood shift knob, modern stereo. – Dull brightwork. Good, lightly worn interior that was redone back in 2001. Good driver quality repaint. The weather stripping is getting a bit frayed. Tidy unrestored chassis. Tastefully upgraded to make it more drivable in modern traffic, but still looks like an ordinary Beetle. While never fully restored, it has gotten everything it needs to keep it looking good and running well. – 1967 was the last year before the Beetle saw significant changes, which were mostly changes in the name of safety and not for the better from a collectability standpoint. Pre-1968s are therefore worth a few grand more and the upgraded engine, transmission and electrical system do it many usability favors. Crossing the block so early on day one of the auction, though, didn’t do this car any favors and it was snatched up at a bargain price. 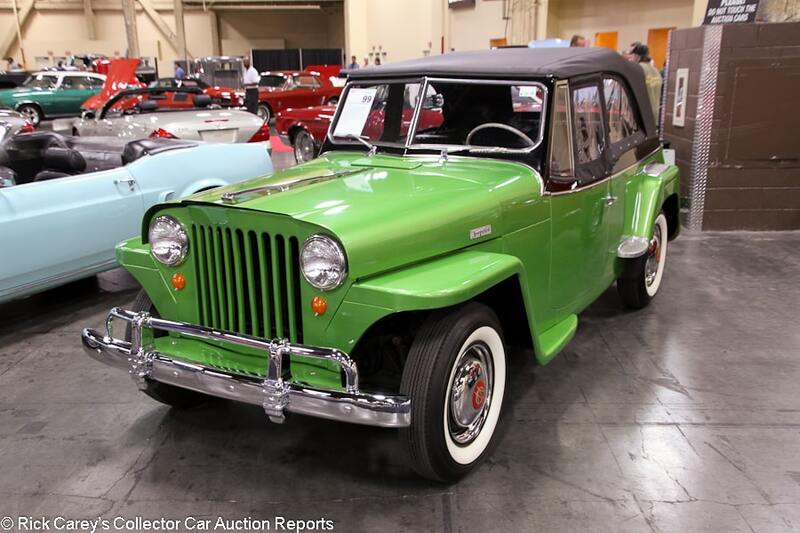 Lot # 99 1949 Willys Jeepster Phaeton Convertible; S/N U90202; Light Metallic Green/Black vinyl; Black Vinyl top; Truck restoration, 3 condition; No Reserve; Hammered Sold at $16,000 plus commission of 10.00%; Final Price $17,600. – Hub caps and trim rings, whitewalls, column shift, rear-mounted spare wheel. – Decent clear coat paint with a little bit of orange peel, but this metallic light green color isn’t factory correct. The chassis is clean and freshly undercoated, but some black overspray got onto the right rear hub cap and tire. The step plates on the body are old and dull. Perfect new top and very good upholstery, but there are cracks in the steering wheel and the switchgear is dull. A superficially redone Jeepster resulting in a sound but unattractive driver. – These are Grampa vehicles, ideal for taking loads of kids to the beach or down to the DQ for a treat. Nannies will object to: 1) no car seats; 2) no seat belts; 3) no rollover protection; 4) no child-safe doors; 5) no energy-absorbing materials, just steel, tubing and fiberboard. It’s a free-range kid vehicle where the kids have to take responsibility for their individual and group wellbeing. This is what they’re worth in this condition, a barrel of fun for the money. 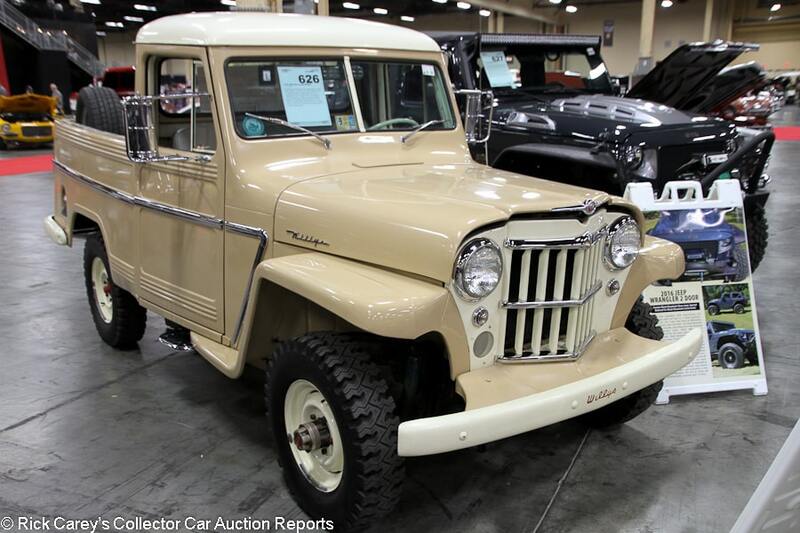 Lot # 626 1955 Willys L6-225 Jeep Pickup; S/N 5516810001; Tan/Gray vinyl; Visually maintained, largely original, 4+ condition; No Reserve; Hammered Sold at $30,000 plus commission of 10.00%; Final Price $33,000. – Dual mirrors, Super Hurricane 226/115hp engine, 3-speed, spare wheel in the bed, floor shift, radio, 4WD, titled as a 1954. – Represented as Serial number 1 for this model with 2,123 miles from new. Dull but sound old repaint than has numerous chips and scratches. Some light rust is poking through the painted front bumper and there are some paint blisters at the bottom of the doors. The wood trim around and in the bed is dried out and cracked. The chassis was undercoated at some point and the seats have been replaced. A fairly rough old truck, but getting it right again wouldn’t be too hard. – This is a very cool old Willys and if the chassis number represents its actual origin as the first ’55 off the line it is significant as well. How it survived so well, in largely original and unrestored condition, is amazing. This is Cameo money, and it deserves to be.